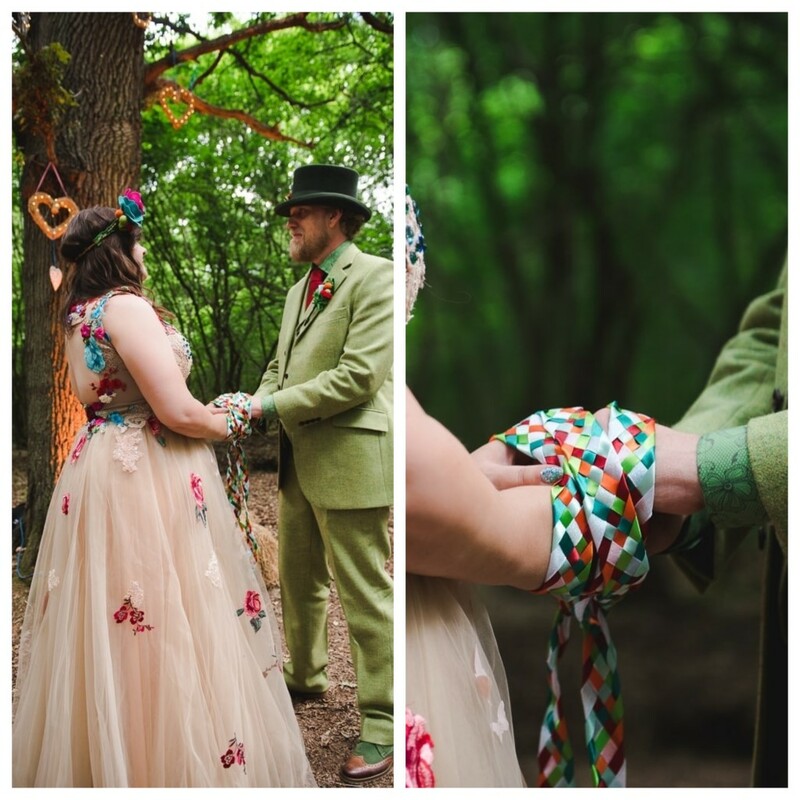 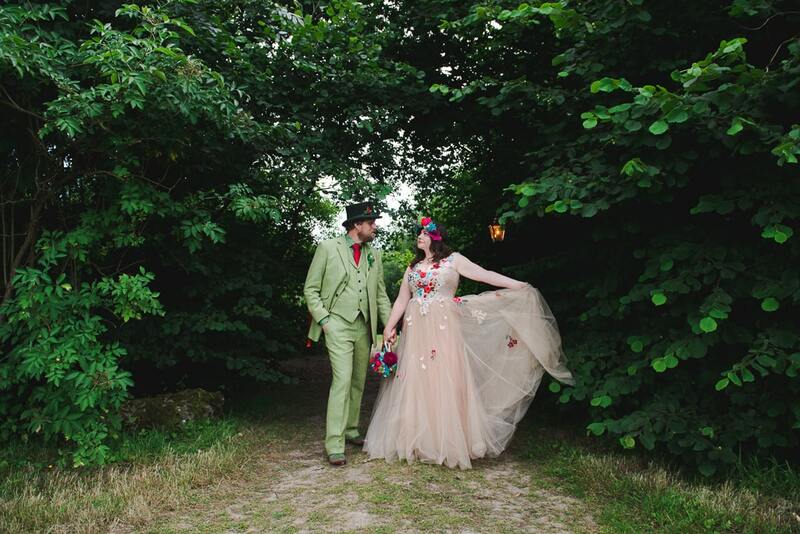 Today I am excited to share this gorgeous colourful Festival inspired Wedding with a Chotronette gown and handcrafted details. 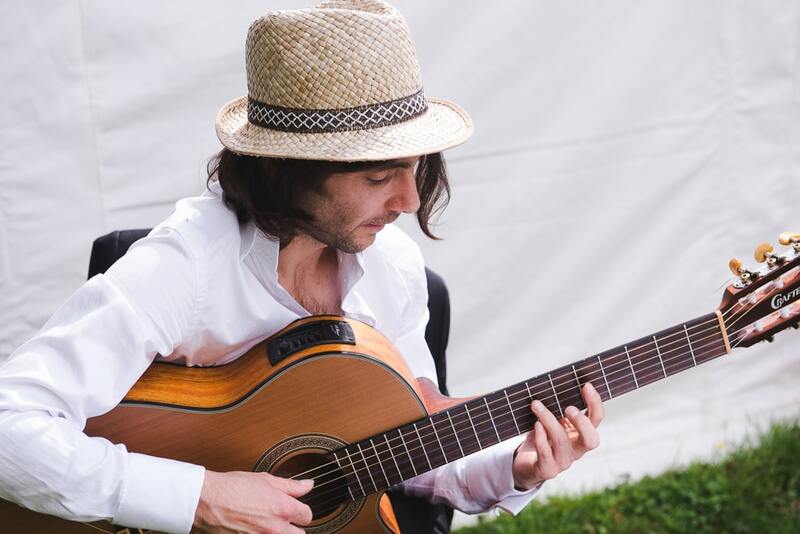 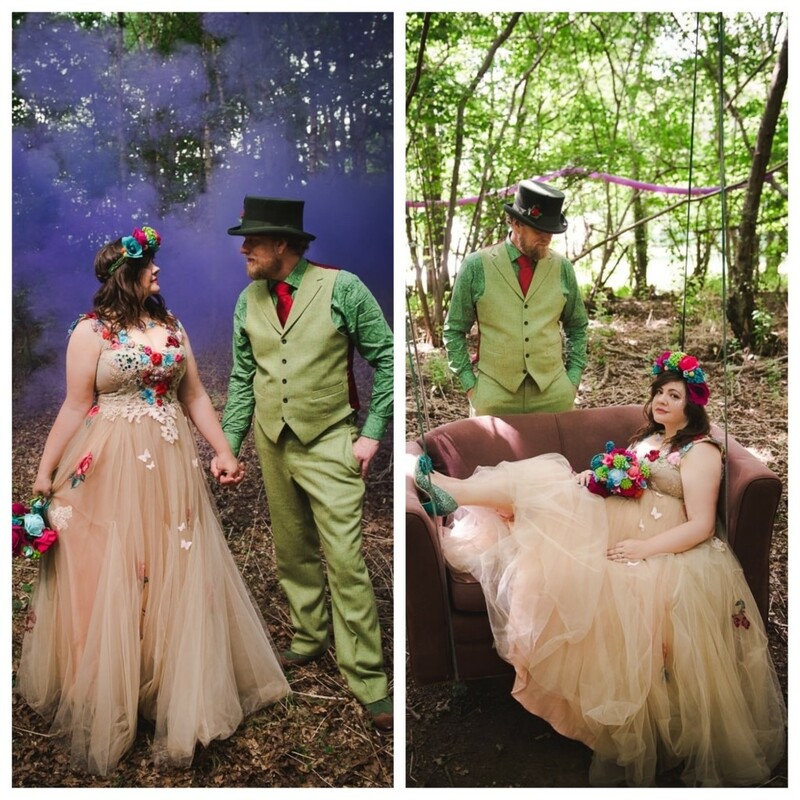 Images were captured by Heline Bekker Photography. 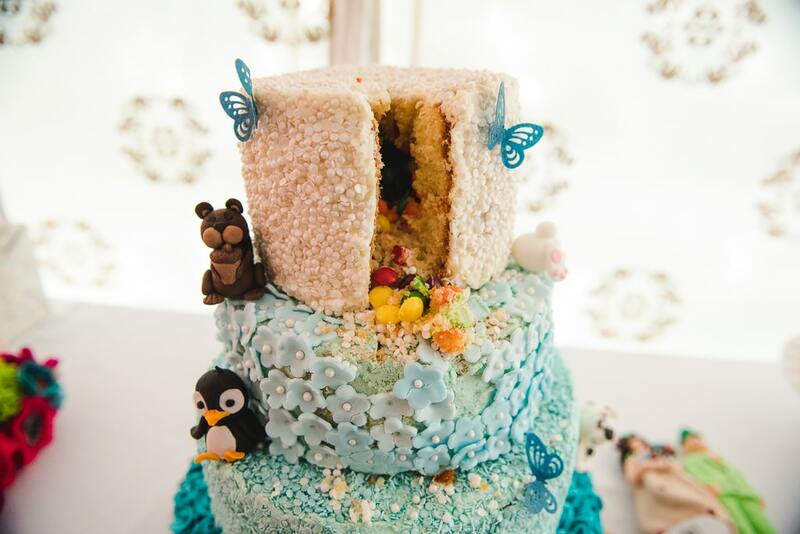 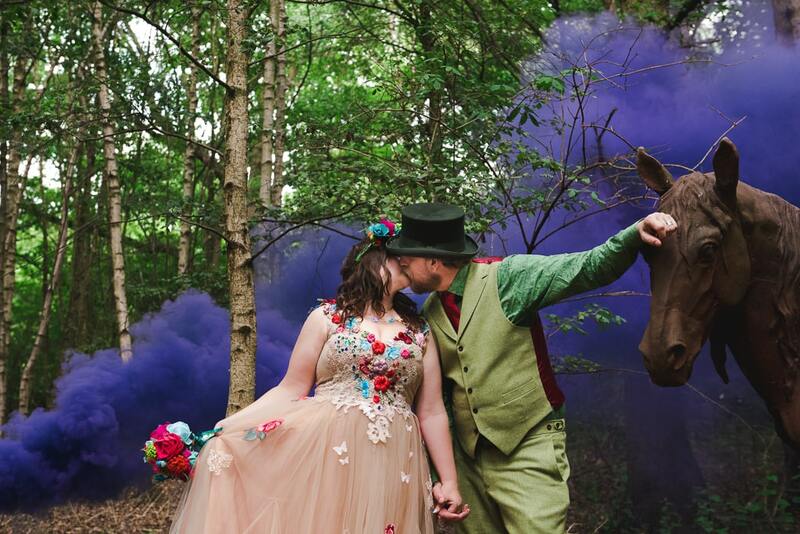 Heline Bekker is a natural Wedding, Maternity and Newborn photographer based in Bexley, but covering London and Essex, Kent, Surrey, Sussex and the South East. 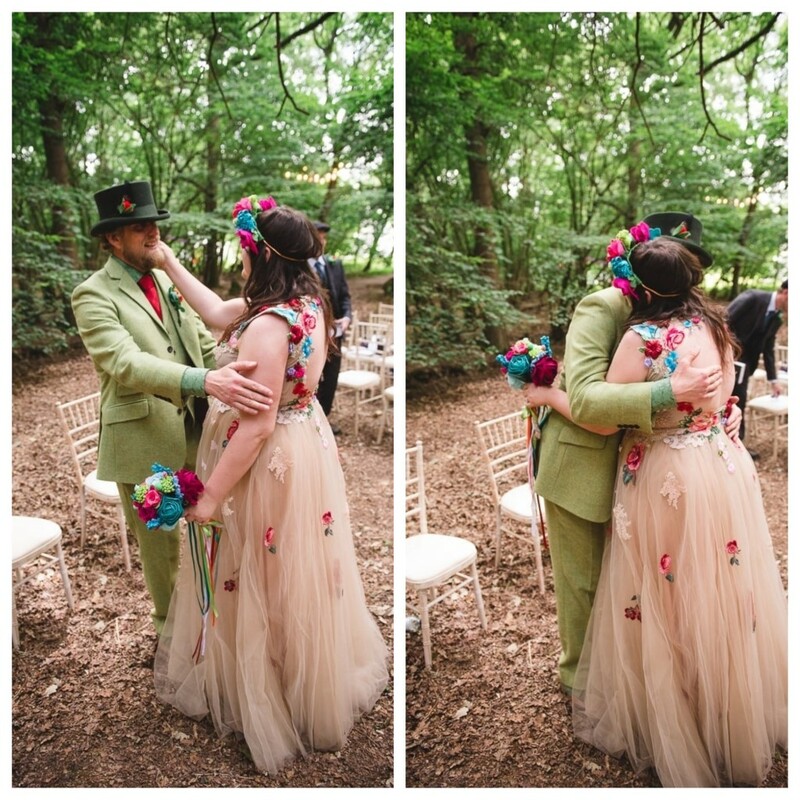 When Anya first got in touch with me, I knew their wedding day will be amazing. 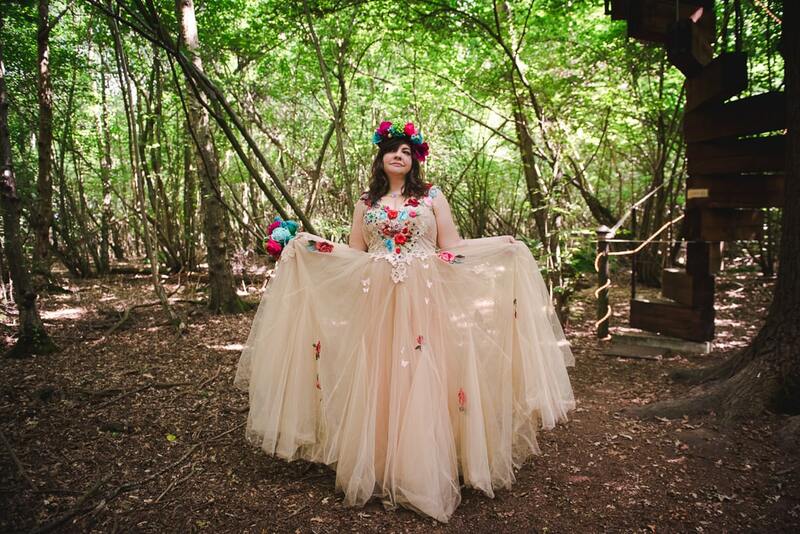 Anya wore a Chotronette Dress dress and made her own Felt Flower Crown and Bouquet! 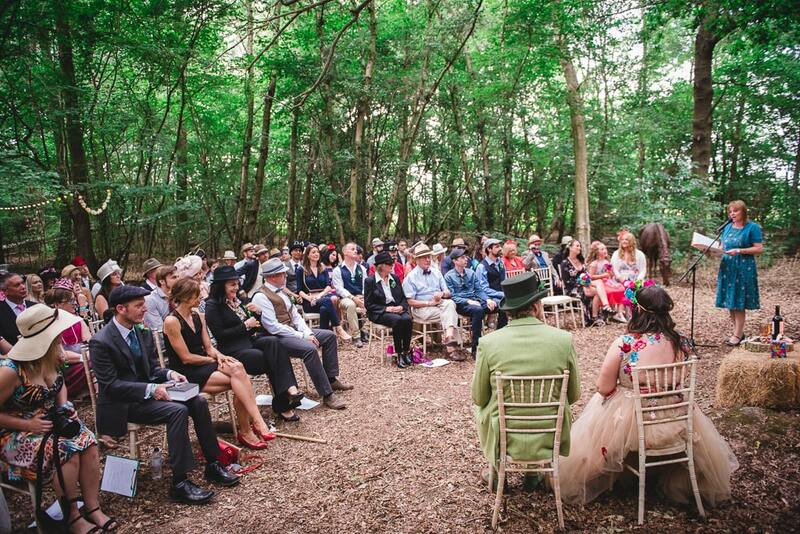 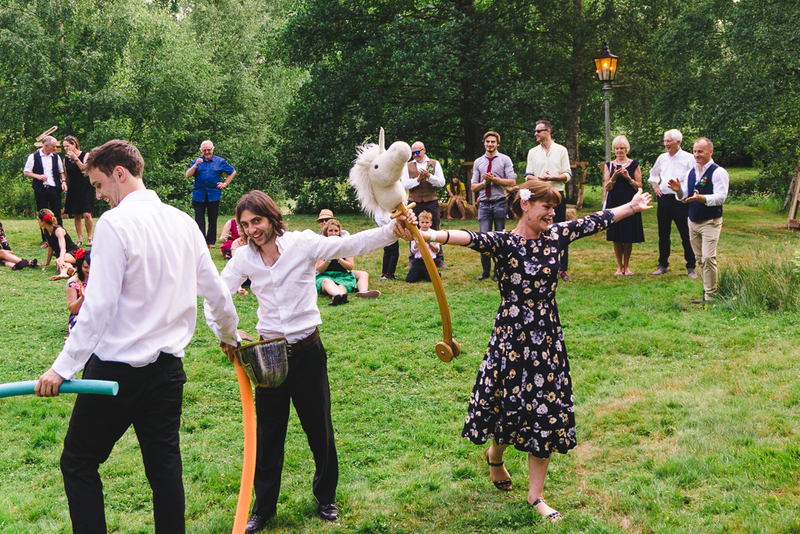 They had a hand-fasting ceremony in a circle of trees, overlooked by two life-sized bronze horses! 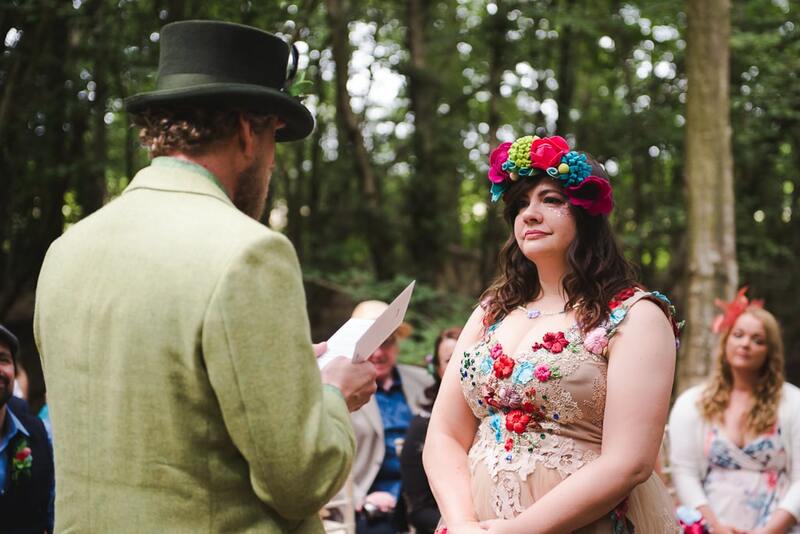 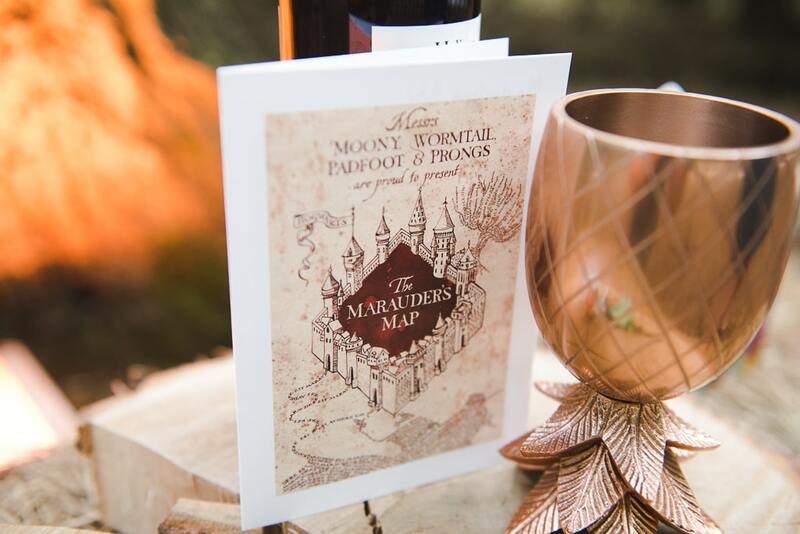 It was written by Katie (celebrant) especially for them, encompassing their love of adventure and fantasy and matching their vows (which they wrote together) very well. 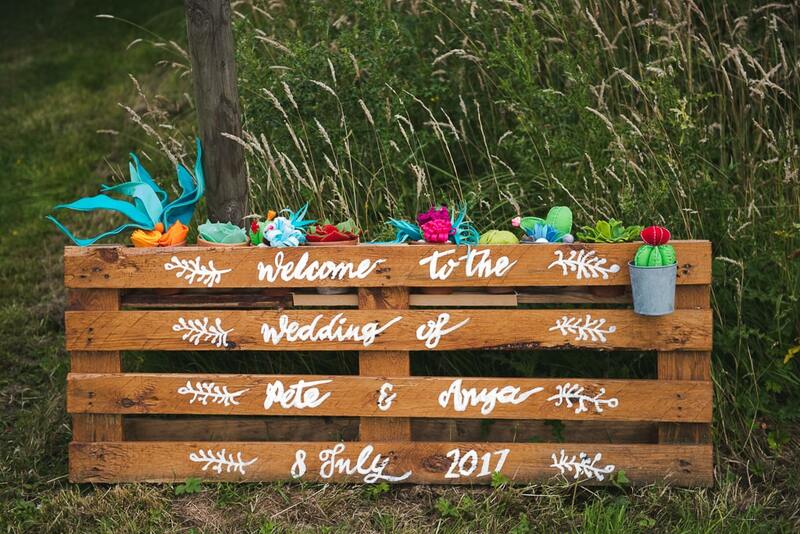 They walked up the aisle through their friends lining the way, Pete first then Anya. 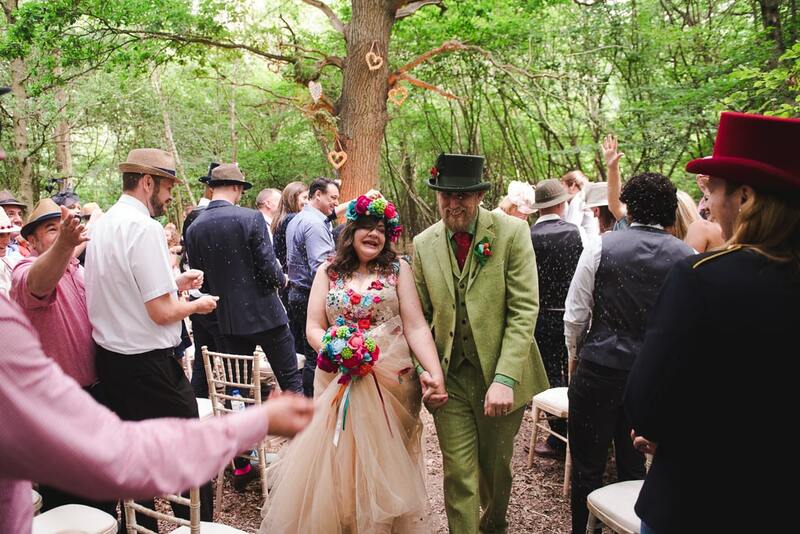 Pete walked up the aisle to the Rocky theme tune, and Anya walked up the aisle to Concerning Hobbits from The Hobbit. 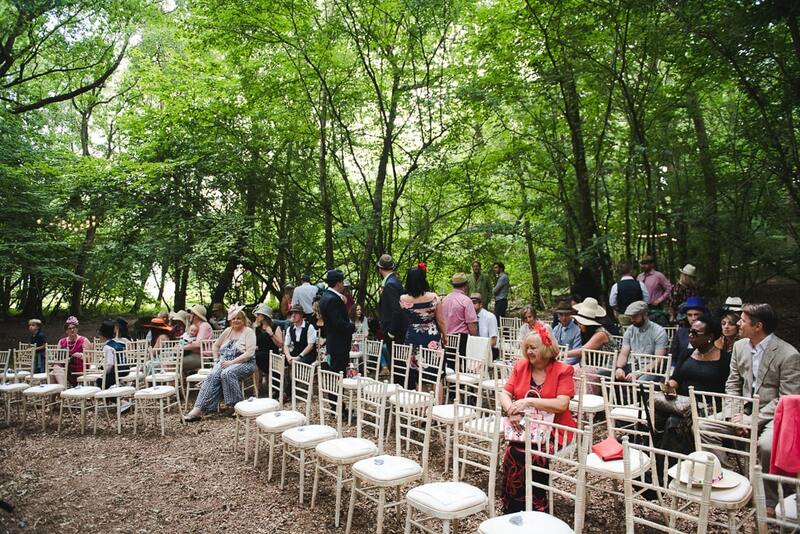 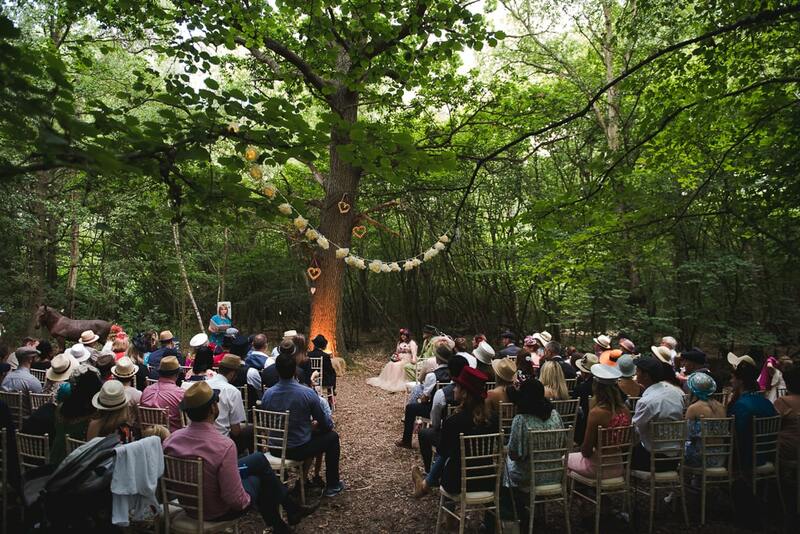 Their guests then took their seats after they reached the oak tree at the front of the circle. 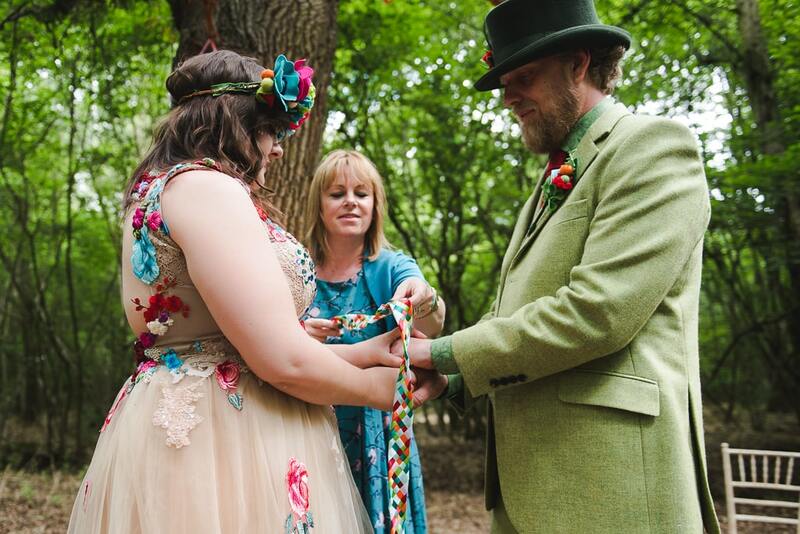 They had a ring warming, which was incredibly personal and meant their guests were able to wish us well in a unique way, followed by a hand fasting and then they jumped the broom to their new life! 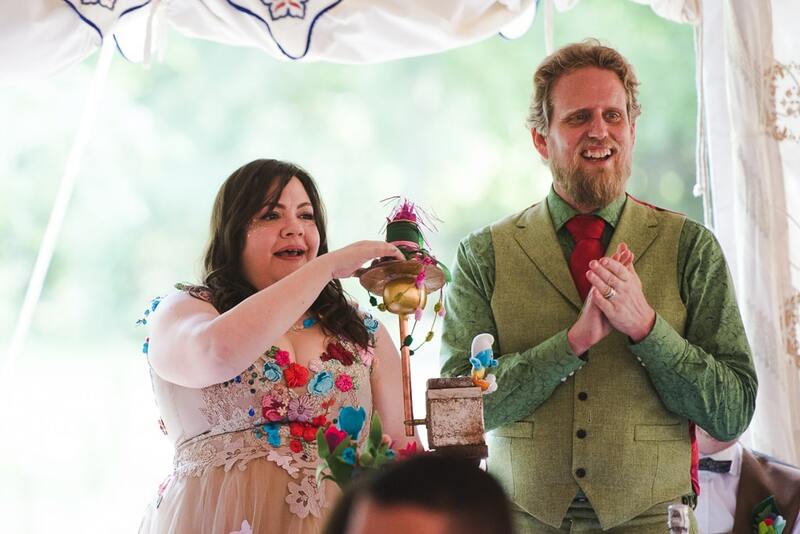 Their friend Martin did a reading for them from Dr Seuss (Oh, The Places You’ll Go), and they had lavender in bags at the end for the guests to throw at them. 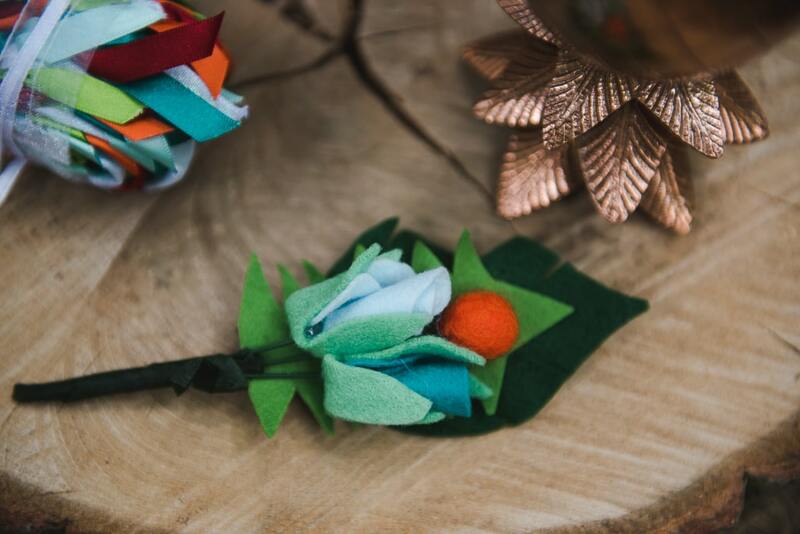 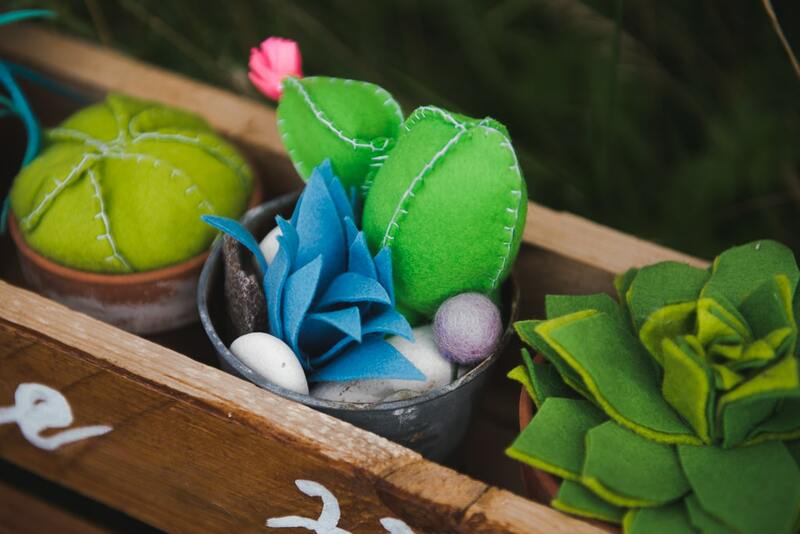 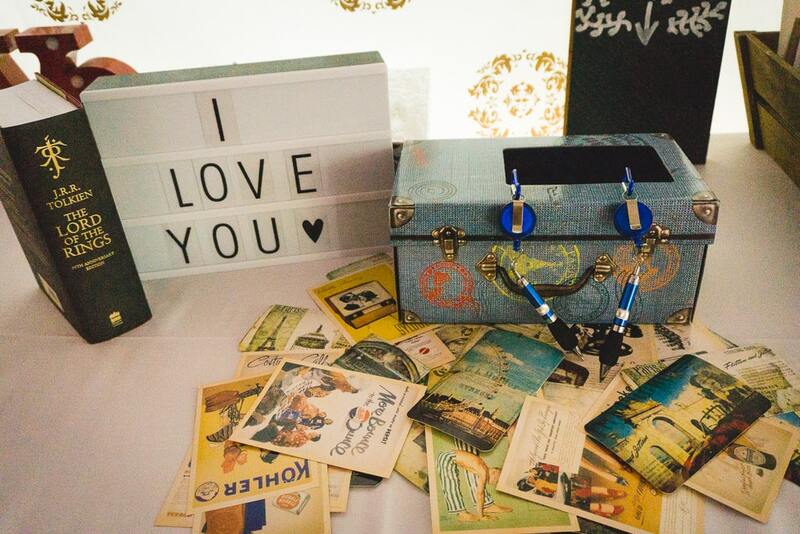 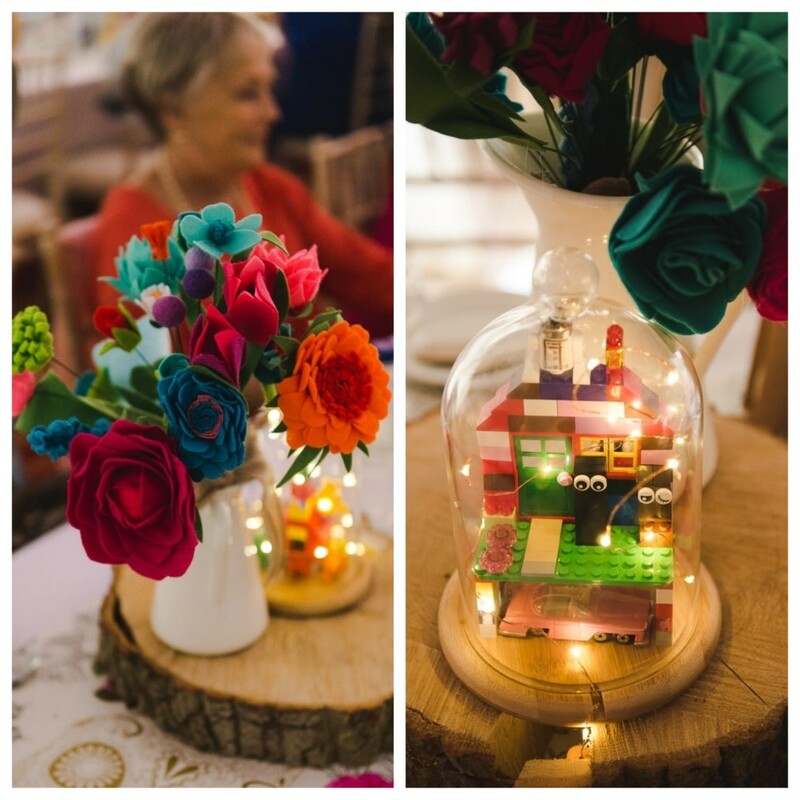 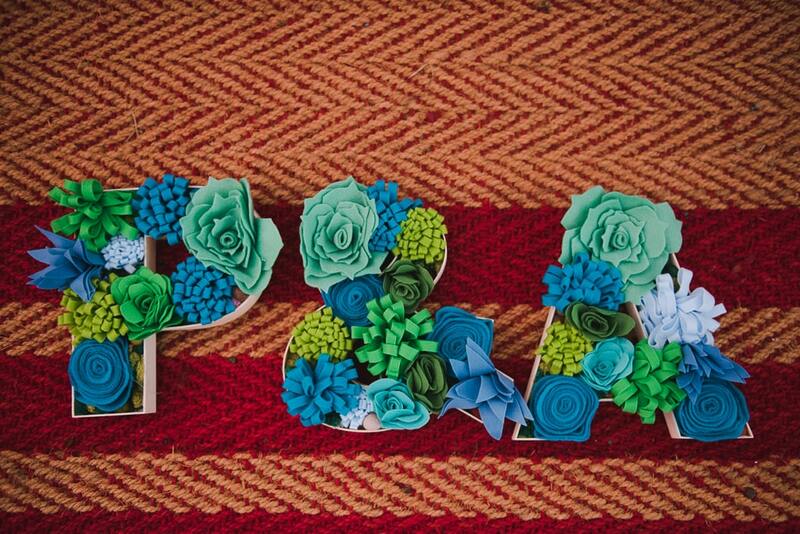 They also made all their table decor, and lots of DIY props themselves for the reception.. 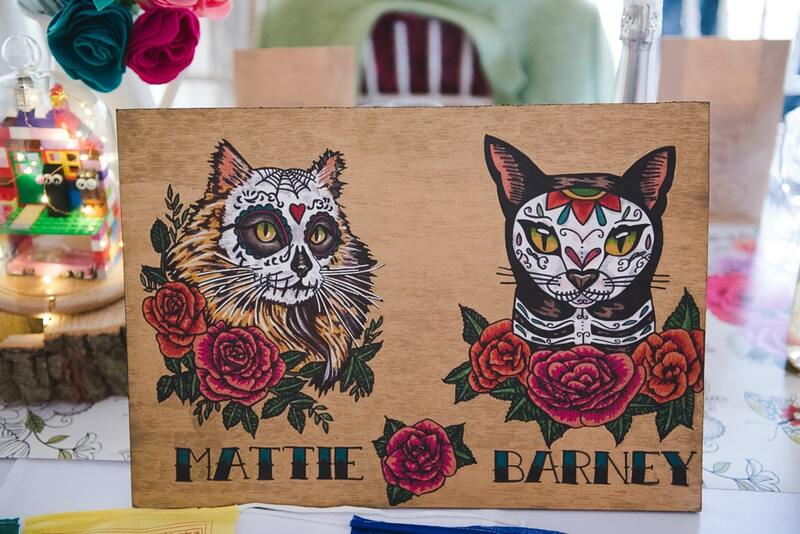 They featured their cats in a variety of ways (on the cake, in a hand painted illustration of us hanging at the entrance and in our centre pieces) but their favourite was the picture of them by Sammy-Lea’s Emporium in a sugar skull style which took centre place on their reception table. 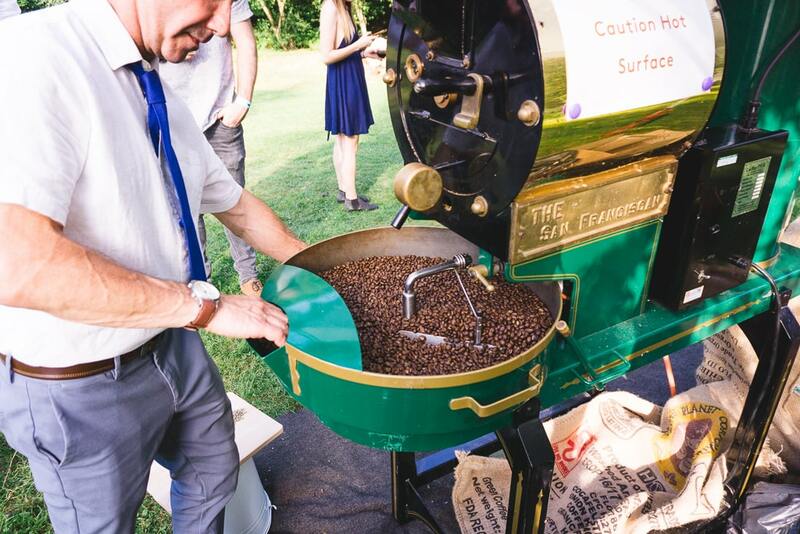 Before we became a couple we met through friends at The London Coffee Festival. 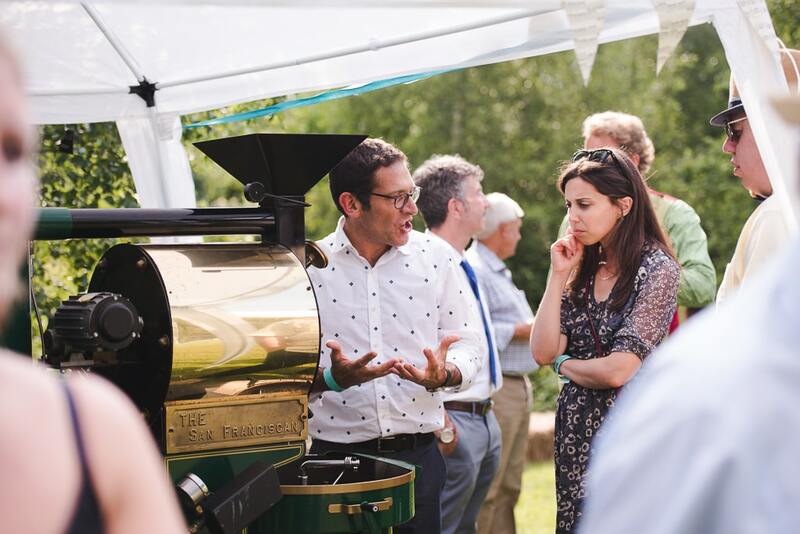 I (Coffee Queen) was working at the festival and Pete (Coffee Geek) fancied me on sight (or so he says now). 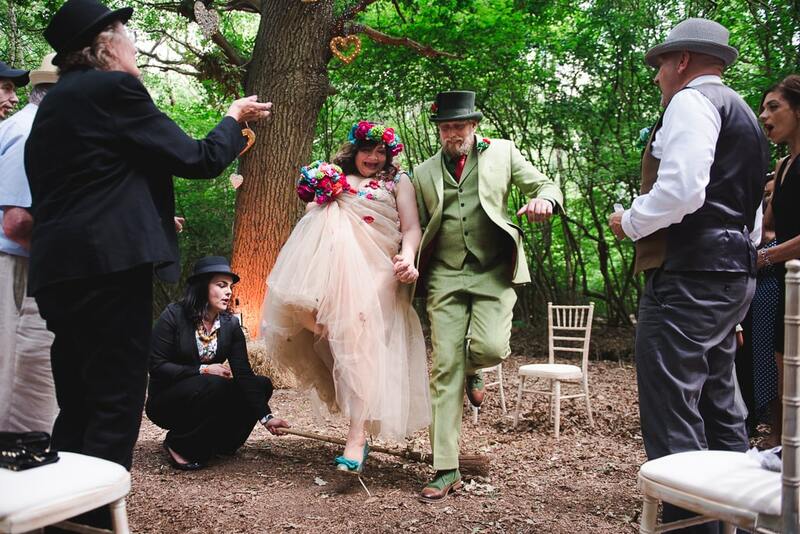 Just over a year later Pete suggested taking me on a day of risk, which was actually a stealth date. 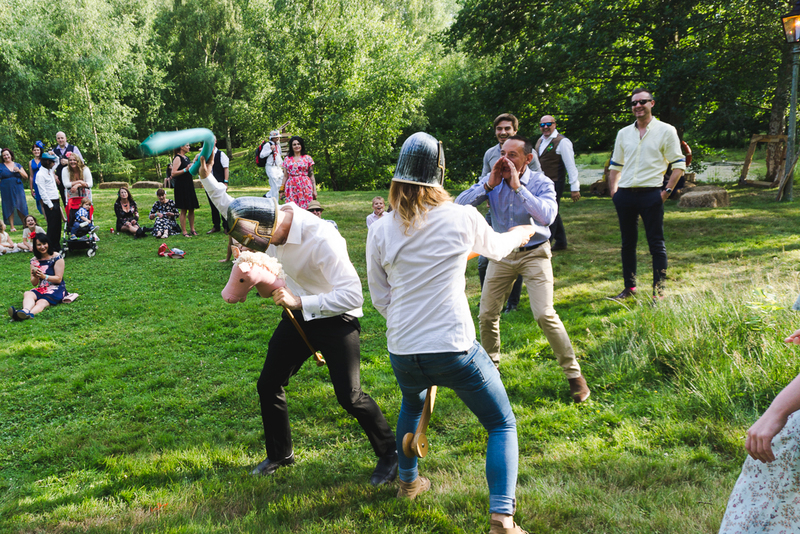 It involved five events I had no clue about, hence the risk. 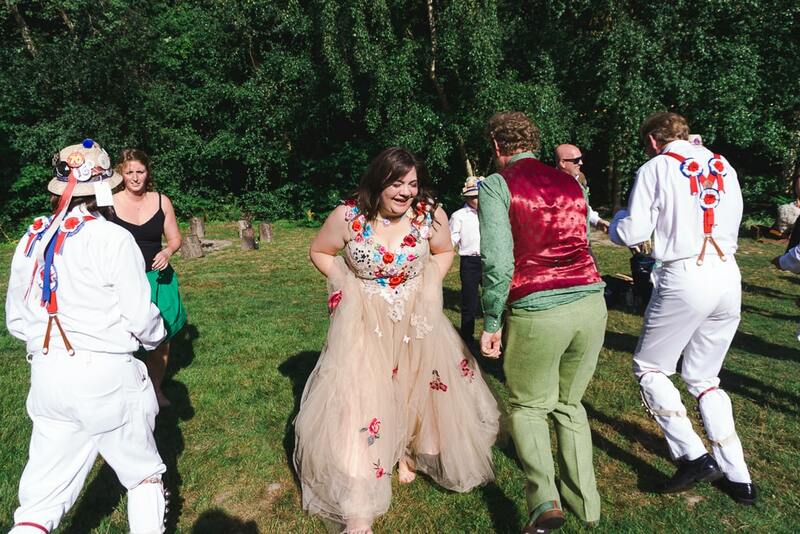 We went racing at Mercedes Benz World, up to the top of St Pauls Catherdral, to an exhibition on Japanese Shunga (basically medieval karma sutra for the Japanese) at the British Museum, for a meal at Dans Le Noir (eating in the dark) and then ended the night at the Guanabara night club where we kissed. 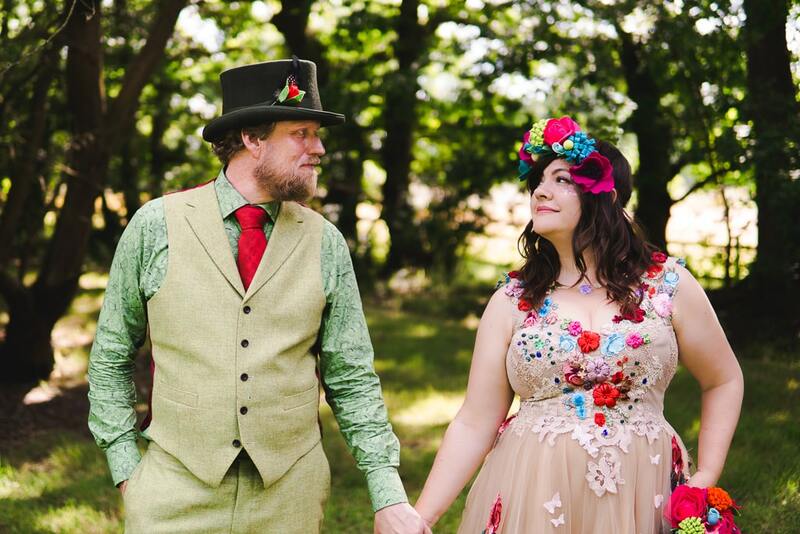 We decided we wanted a pagan / festival wedding, outdoors, with as much ritual and non-traditional elements as possible. 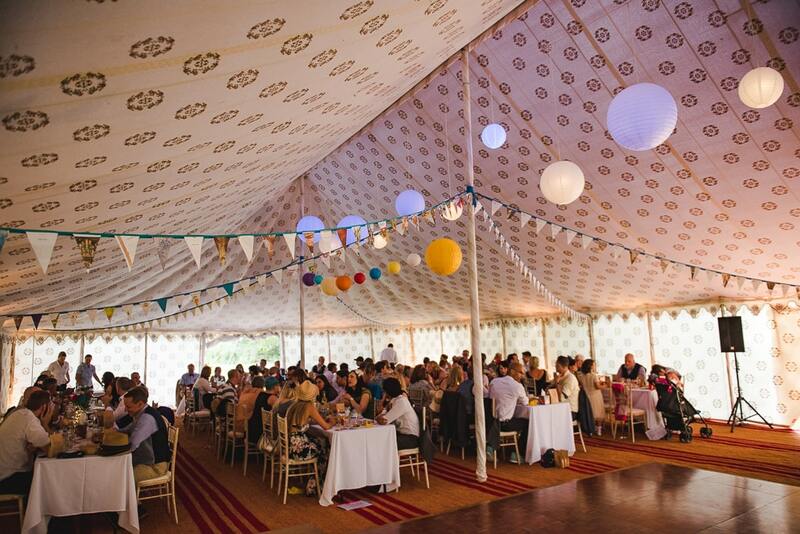 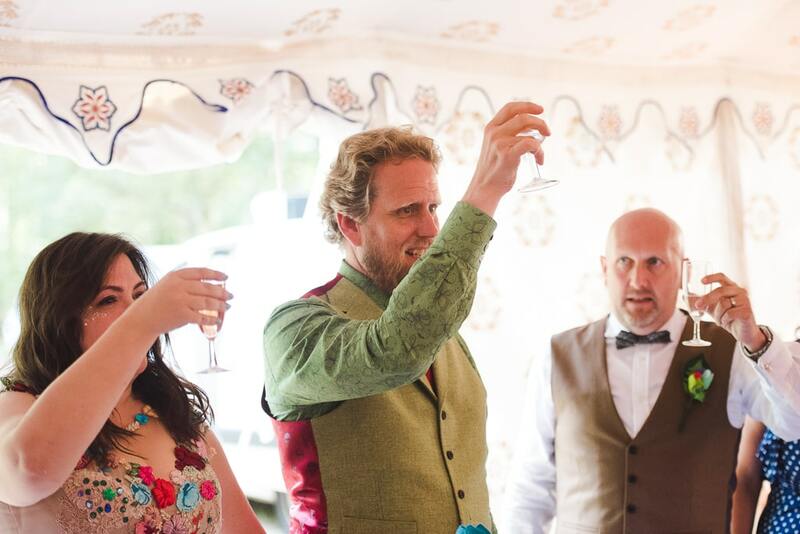 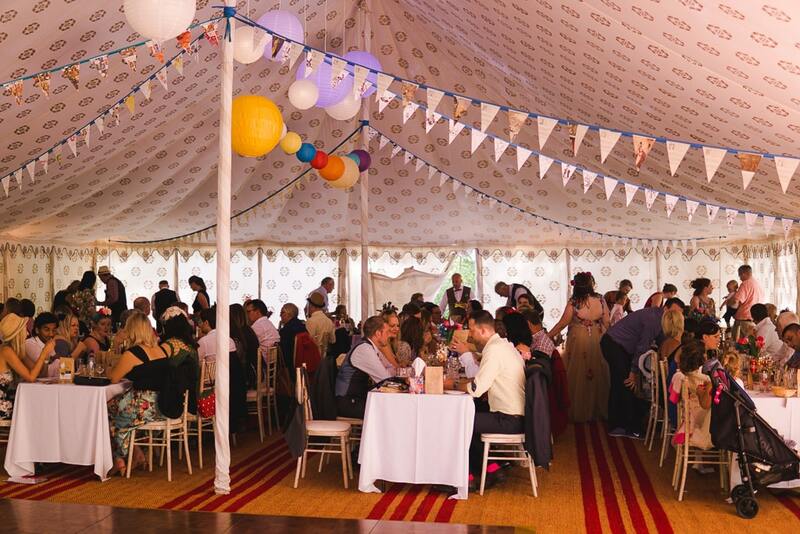 Once we found the venue, Wise Wedding Venues, we then just had to work out how to dress up such a big place, as there was the marriage ceremony area, the big marquee and the area outside the marquee to fill! 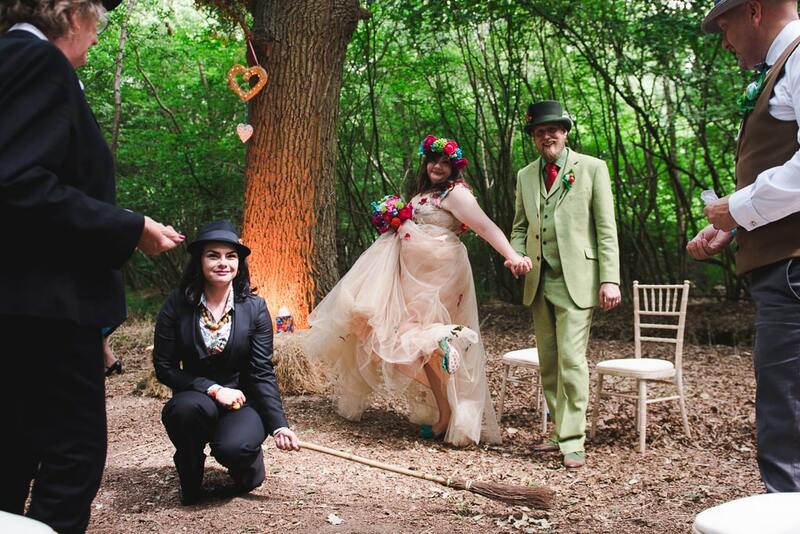 We mainly did everything ourselves, apart from our outfits. 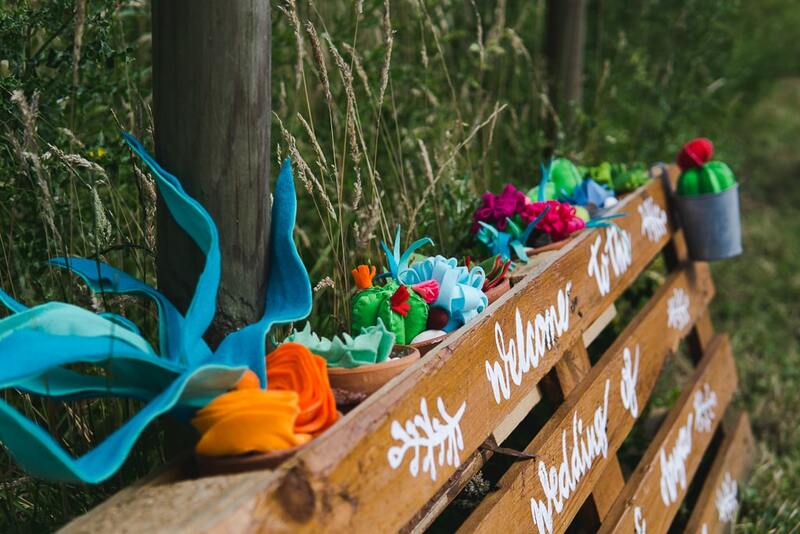 I made all the flowers from felt, we made all the signs from bits of pallet and wood and chalk pens, and Pete made a giant LOVE sign for the exterior of the marquee. 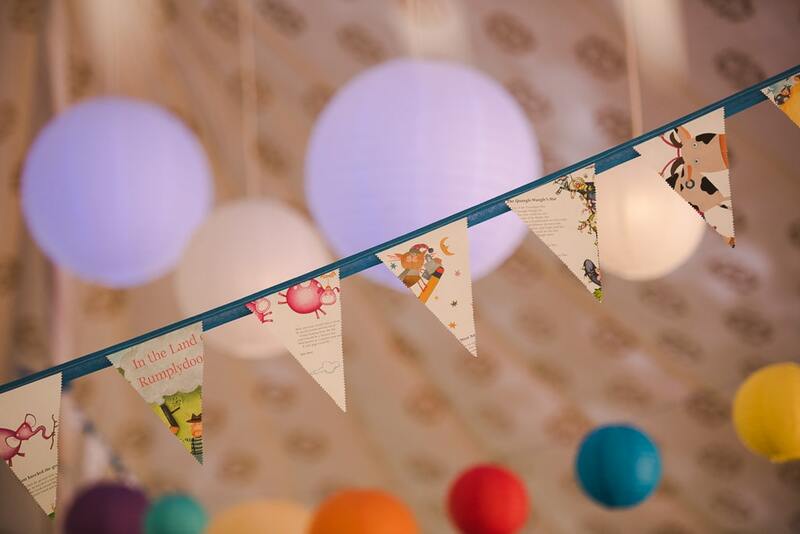 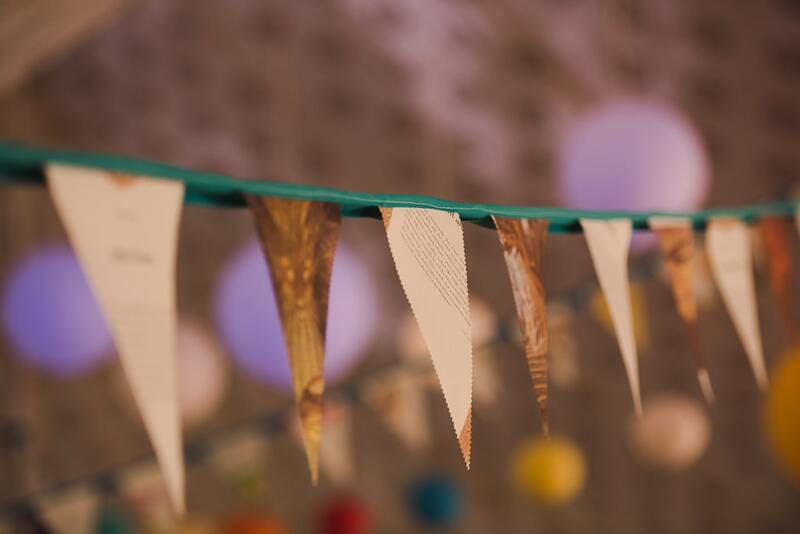 All the bunting inside the marquee was made from old books that meant something to both Pete and myself, including old childhood books, music scores (to represent my grandparents) etc. 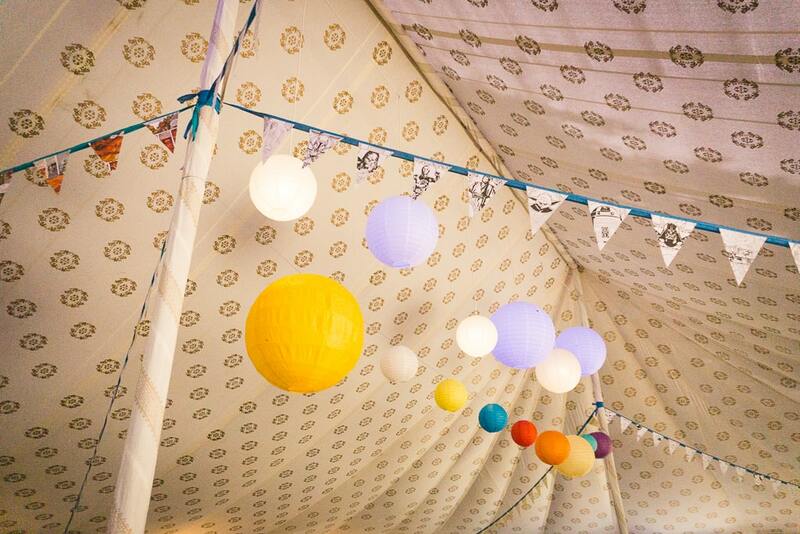 The lighting was giant paper lanterns to represent the planets and our love of astronomy, we had nods to our love of sci-fi and fantasy throughout the venue with different signs and pictures. 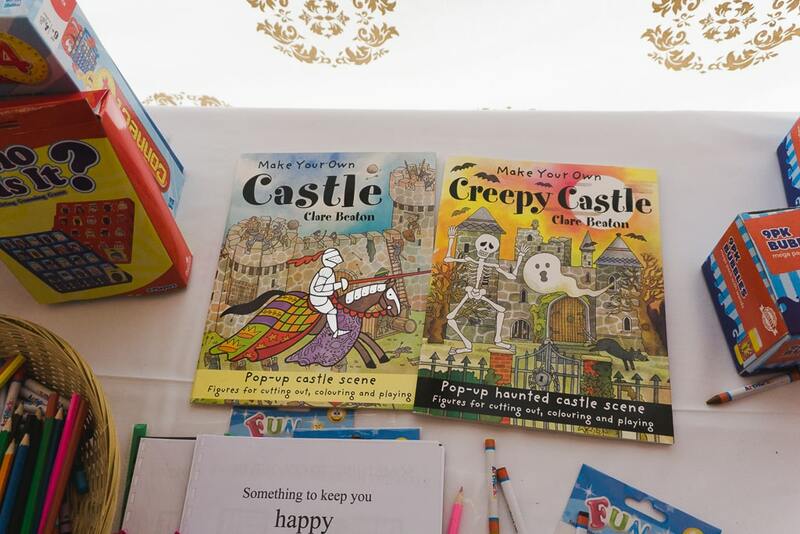 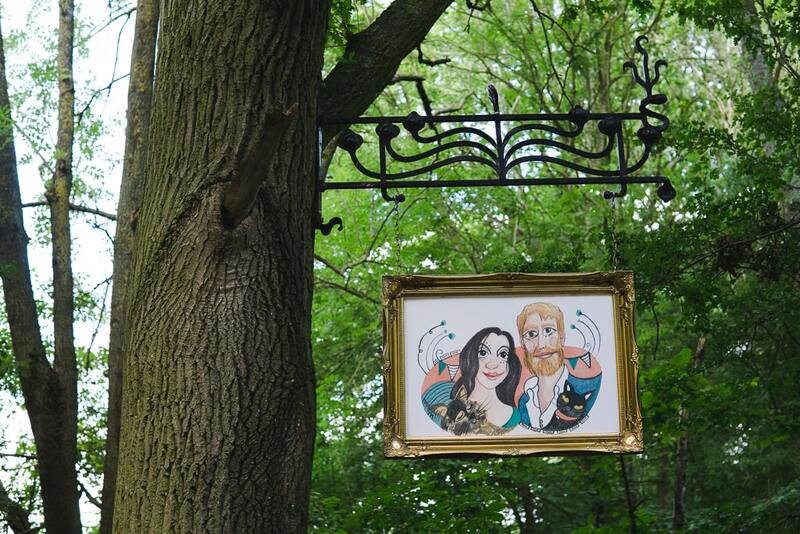 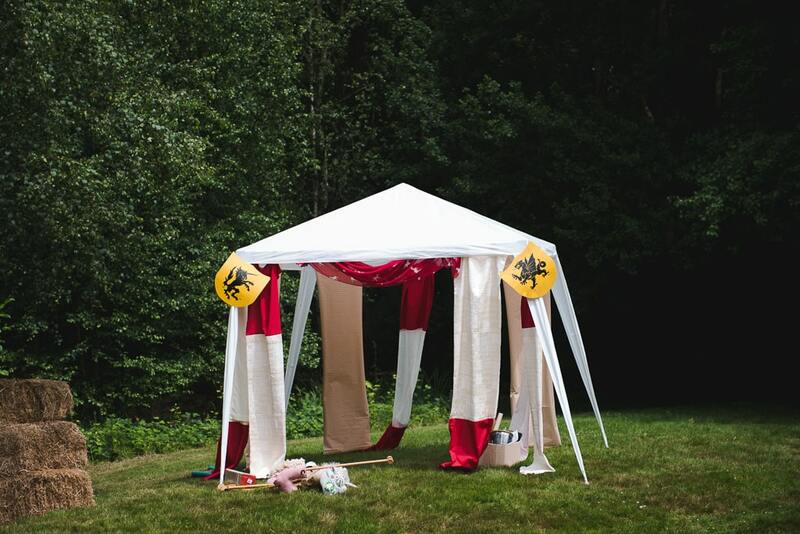 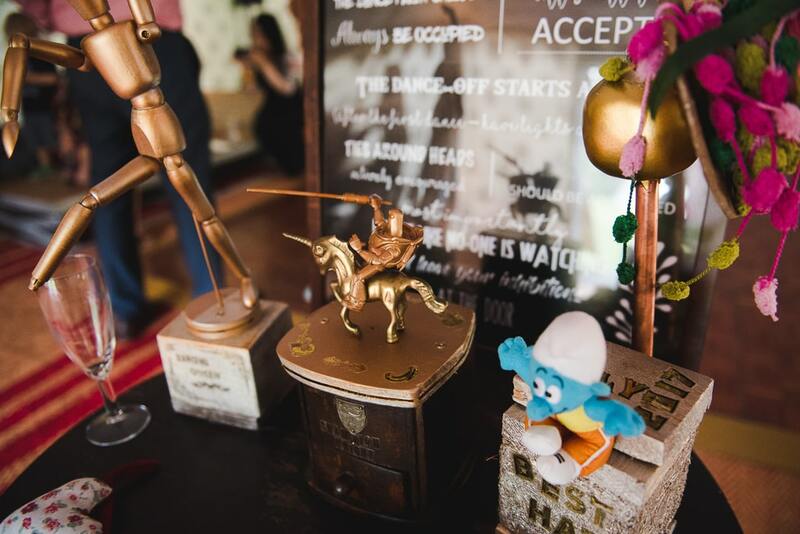 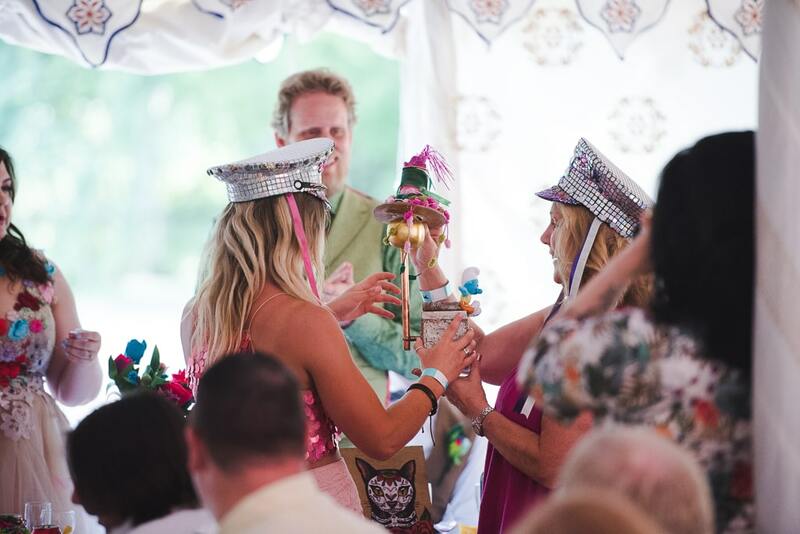 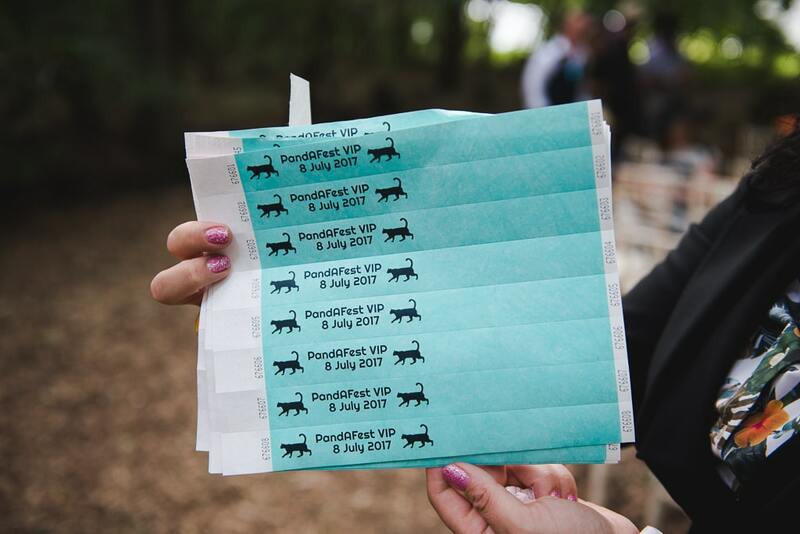 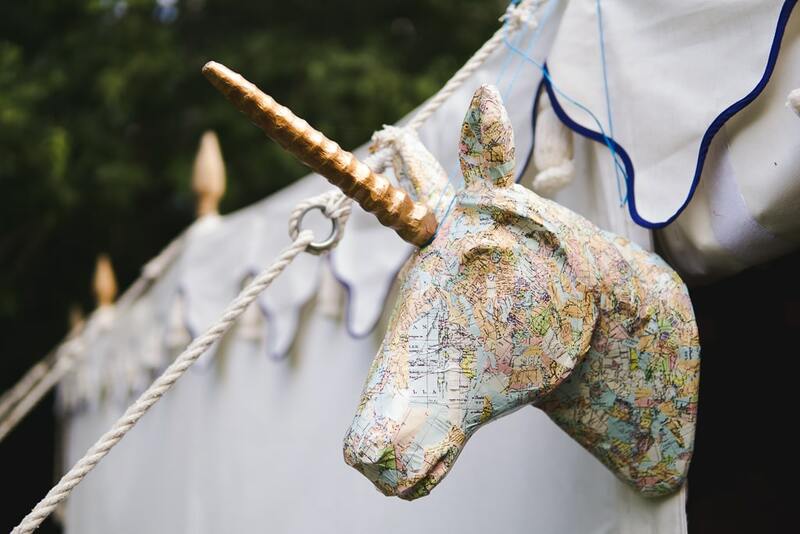 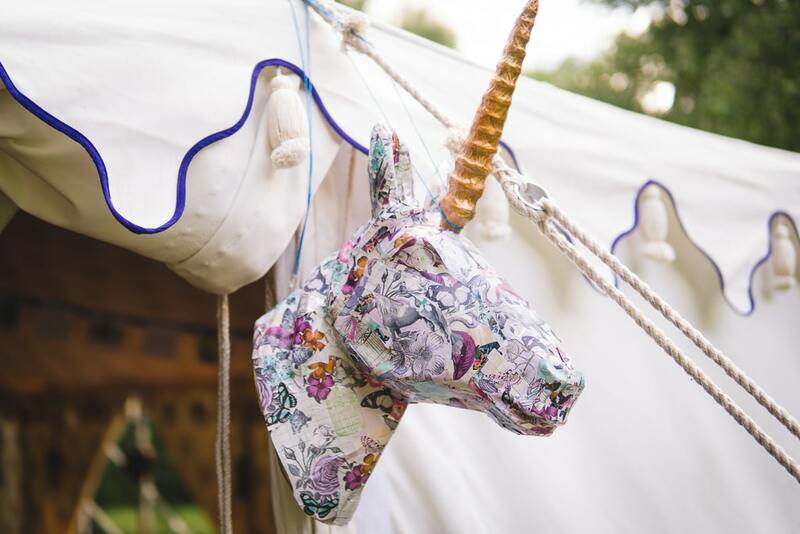 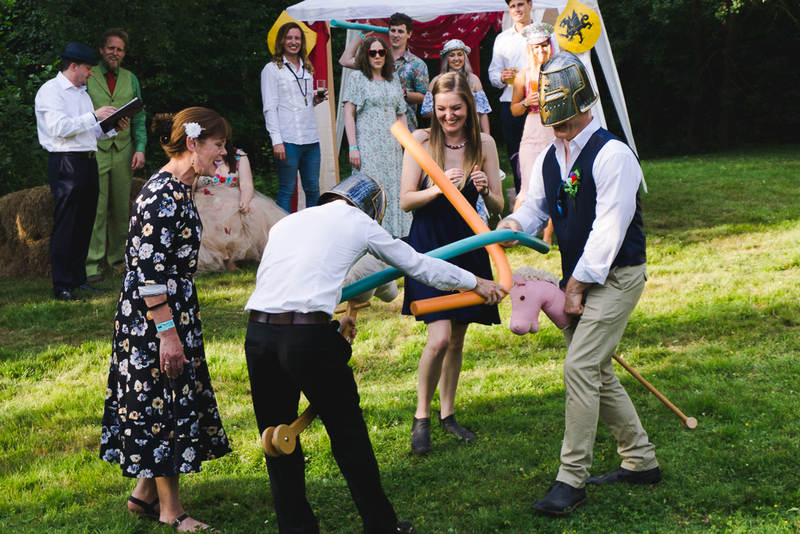 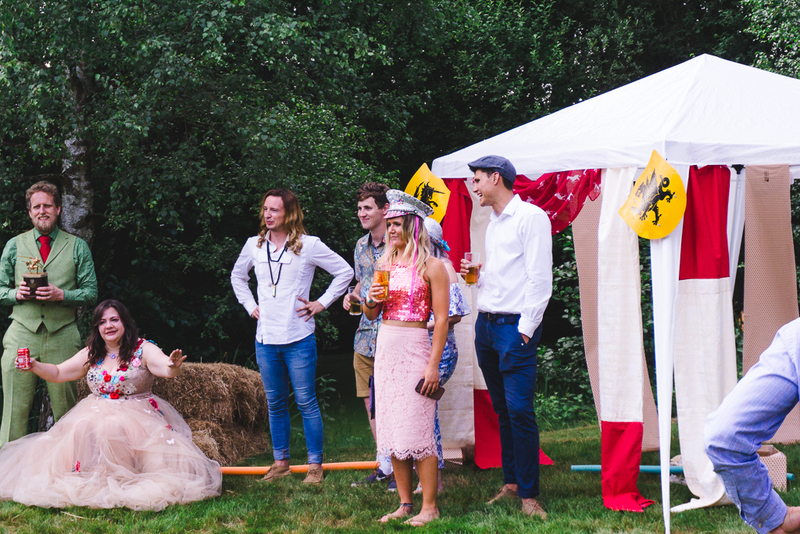 We each decoupaged a unicorn head to hang at the entrance of the marquee and we created areas around the outside for different things including a jousting tent and an animal enclosure (containing a rocking sheep and lots of wicker animals for the kids). 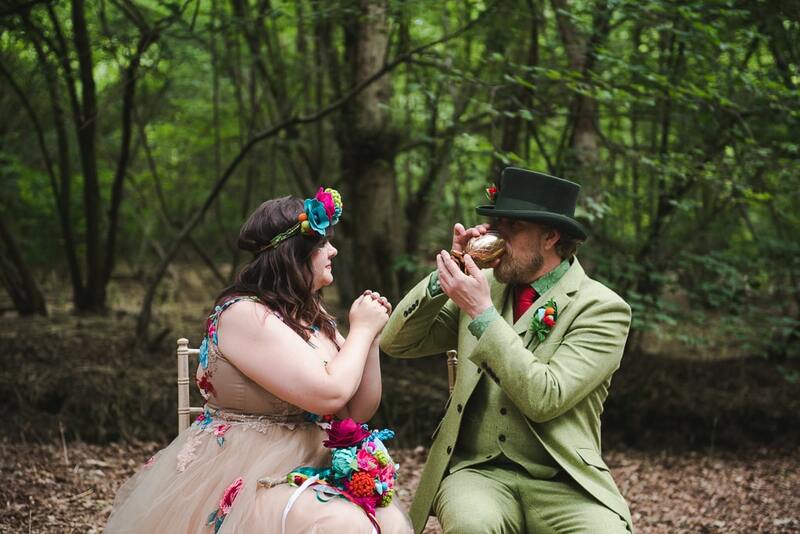 Everything that needed to be created for the wedding was pretty much made by us both. 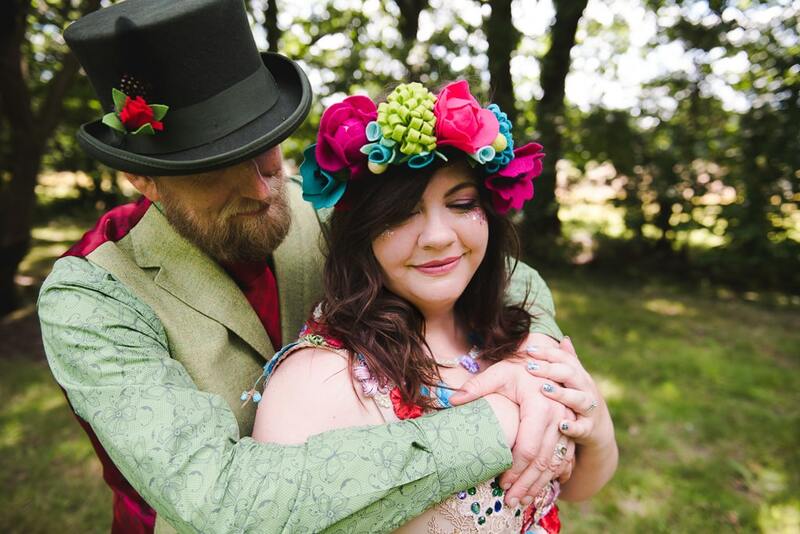 The main theme was festival, and the colours were our favourite colours between us so Teal, Red, Pink, Orange and Green. 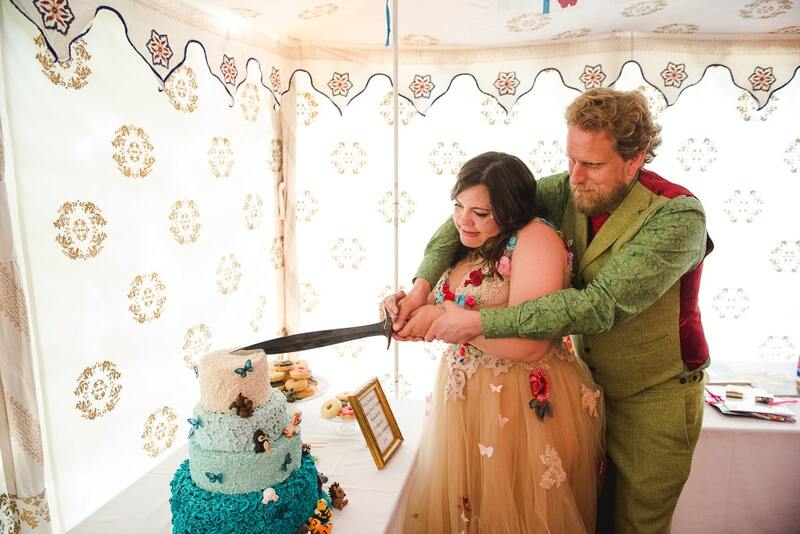 All of it, I don’t think there was one best bit. 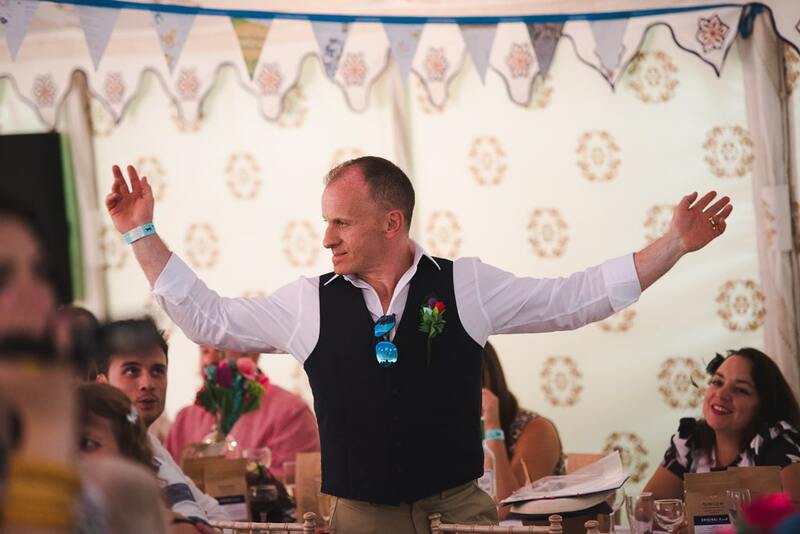 Pete walking up the aisle to the Rocky Theme tune started the day with a bang and it carried on from there! 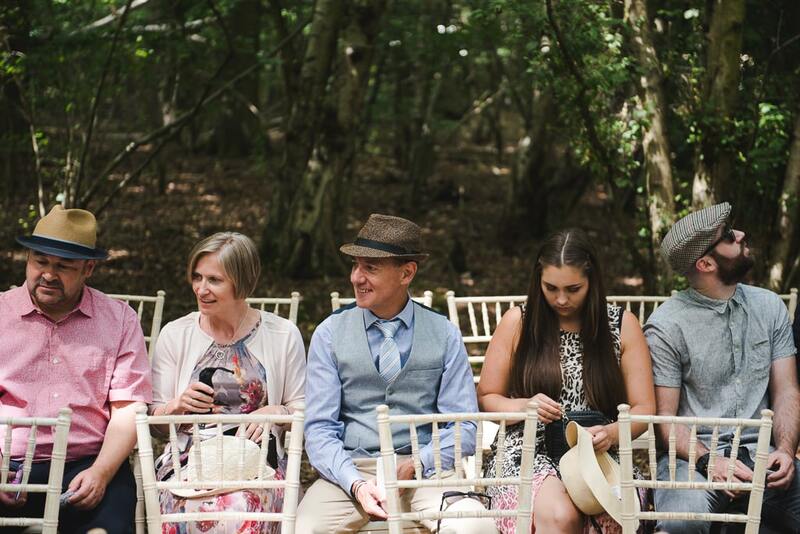 Several guests afterwards commented that they had never been to a wedding before where the focus was as much about the guests as the bride and groom. 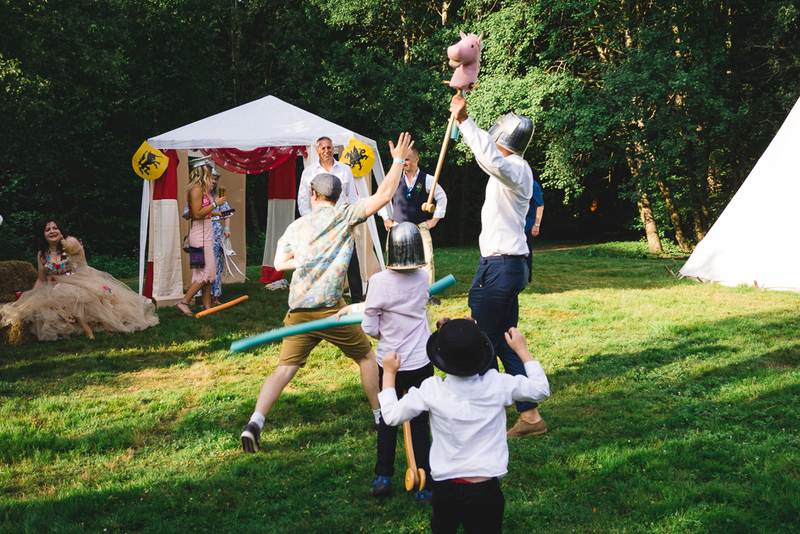 We made sure our guests were involved from the moment the day begun to the end. 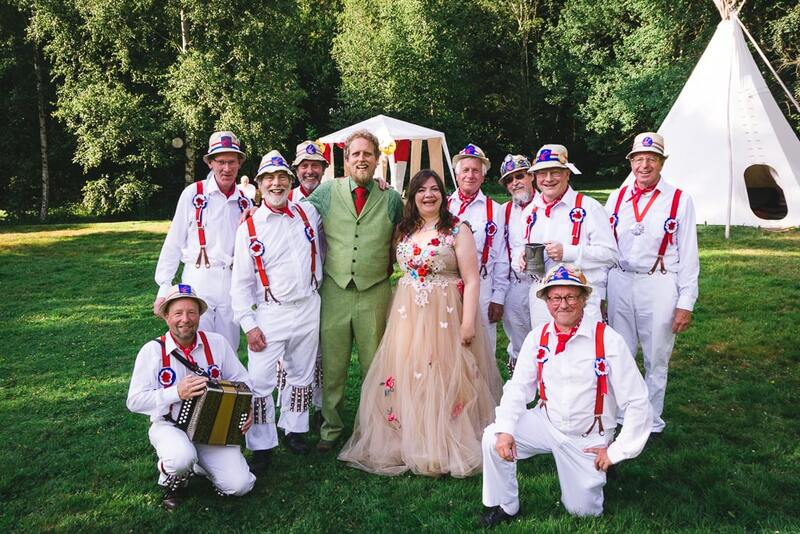 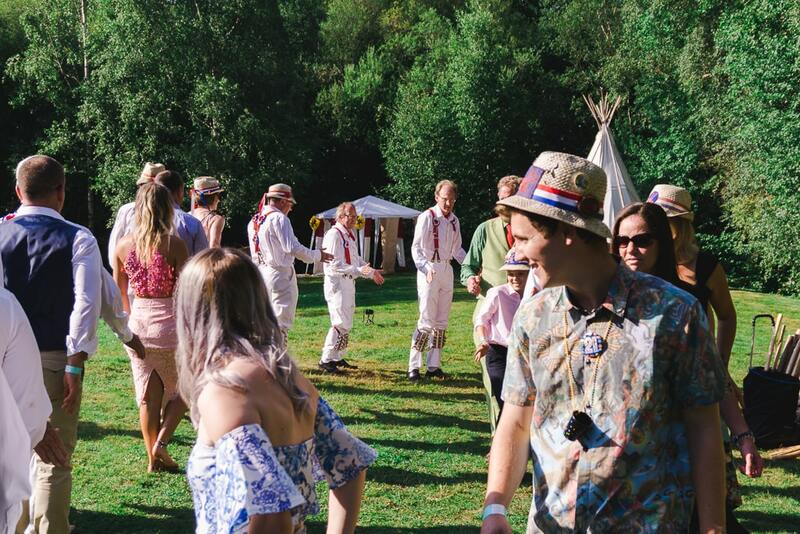 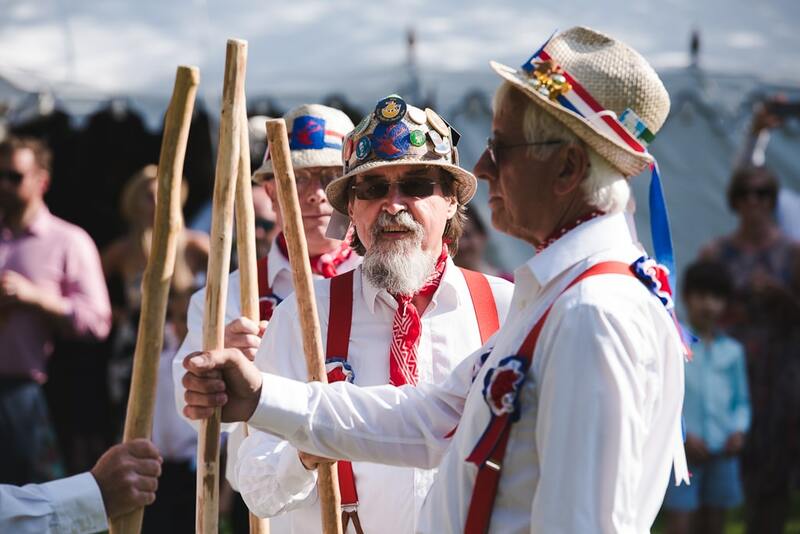 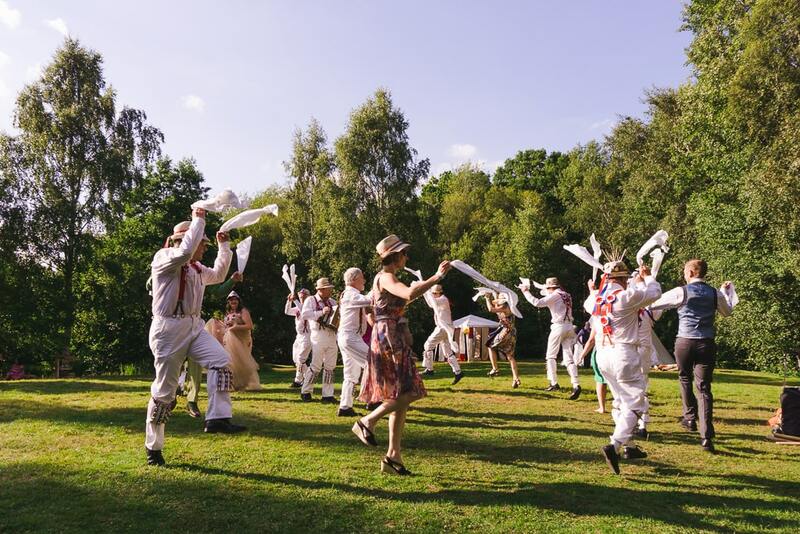 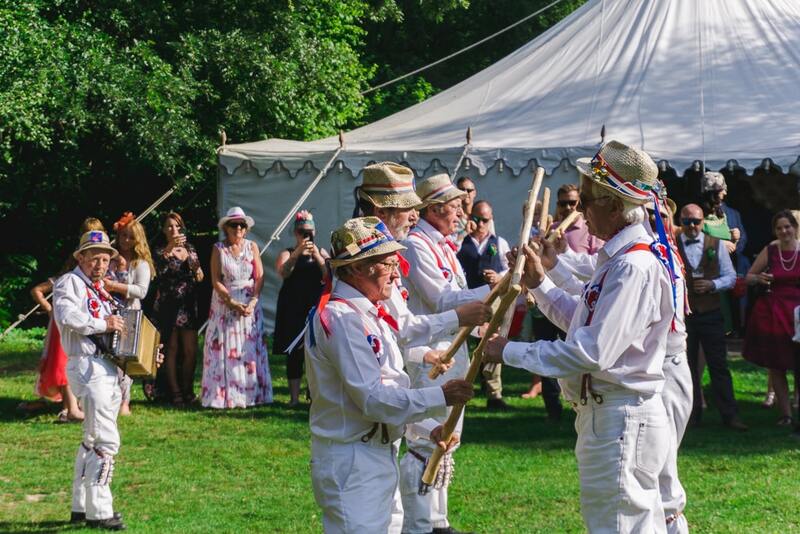 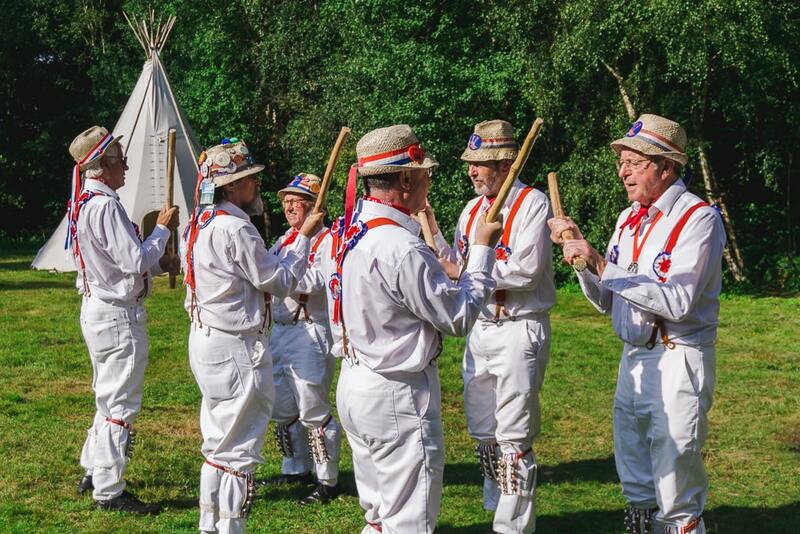 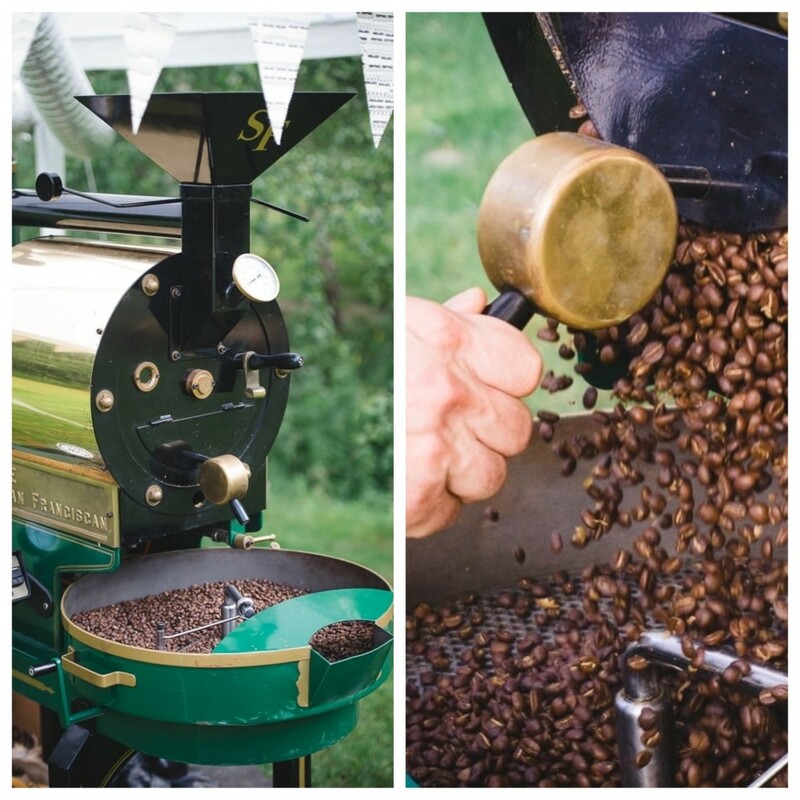 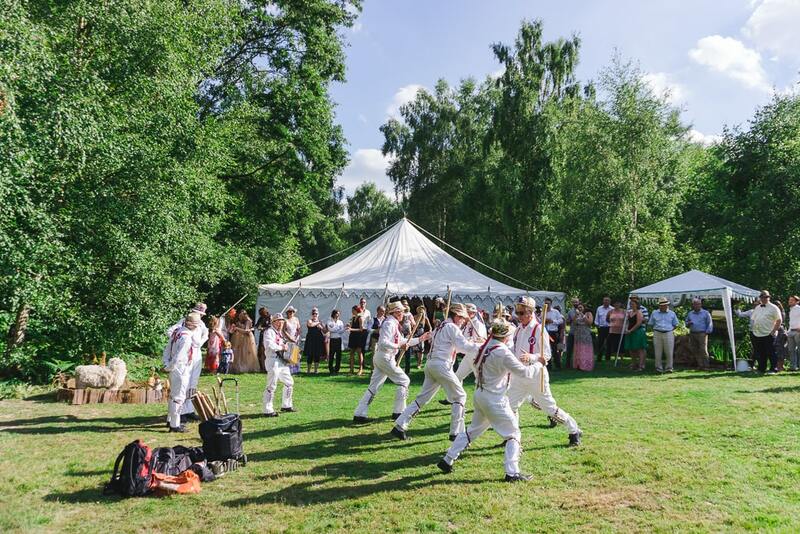 There wasn’t a single moment when something wasn’t happening, whether it was coffee roasting, Morris Men dancing or competitions for the best hat, dancer or jouster – we even made prizes for each competition. 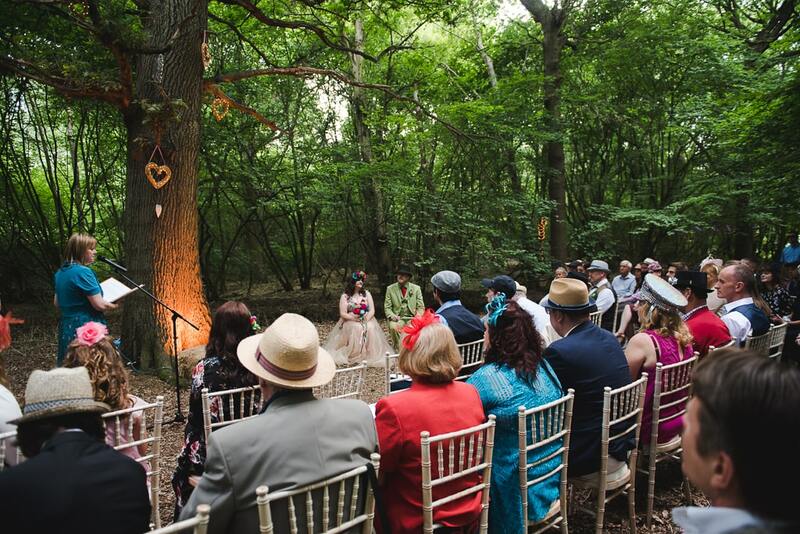 Asking friends again what they thought was different or unique about the wedding, everyone said the same thing: everything! 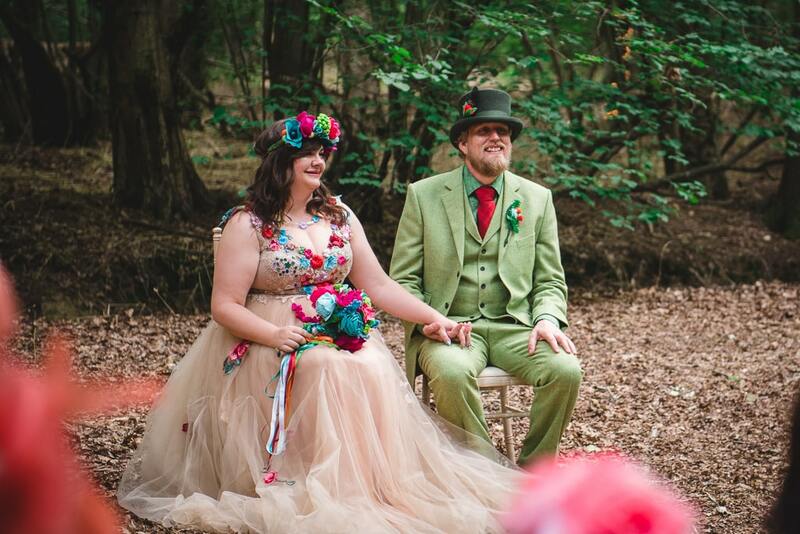 It really was a magical, amazing day. 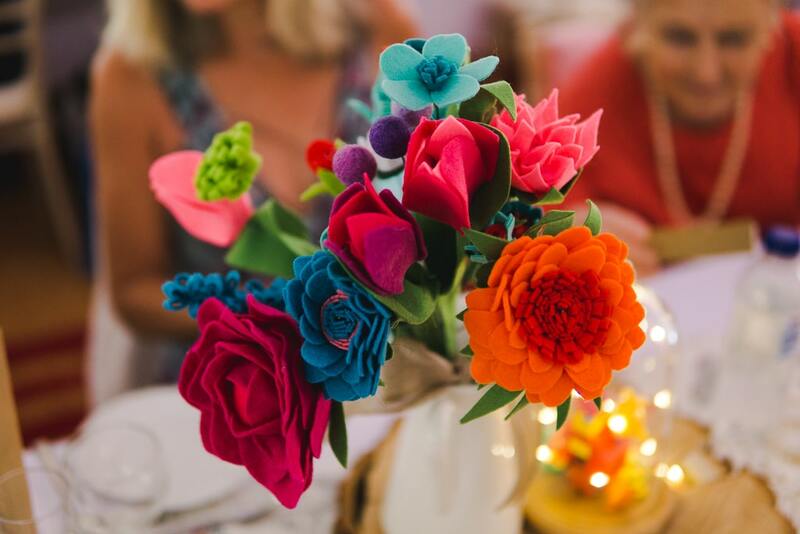 Is there anything you would do differently? 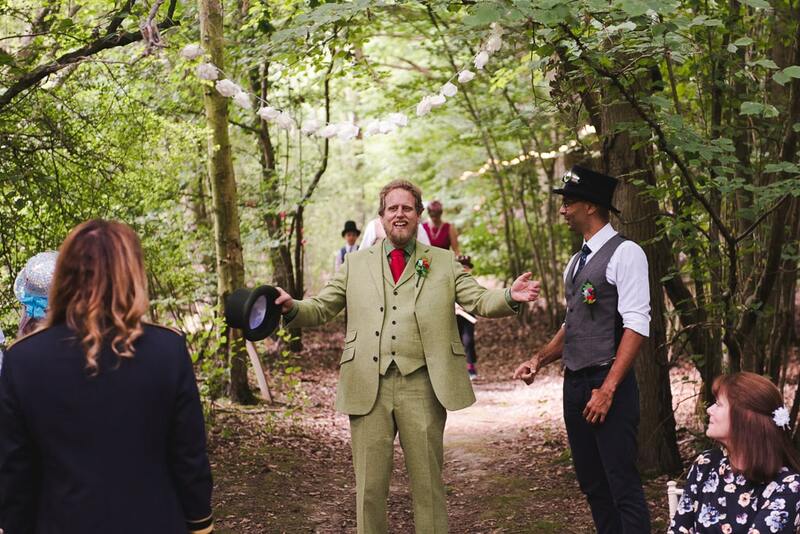 Not one single thing. 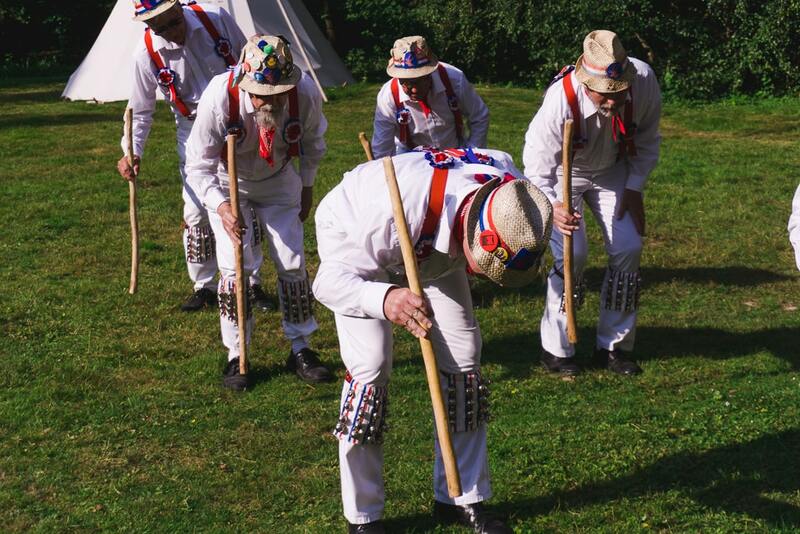 If I could have a groundhog day it would be that day. 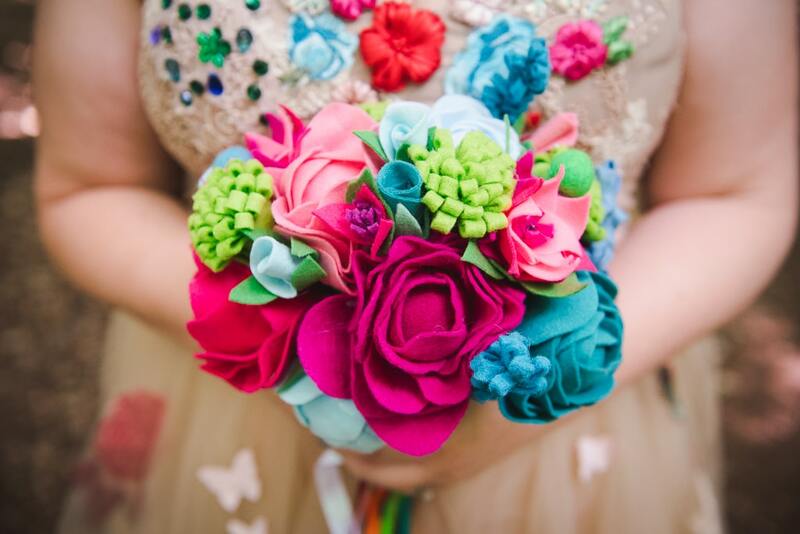 It depends on what kind of wedding you want, but always do what YOU want to do, not what other people want. 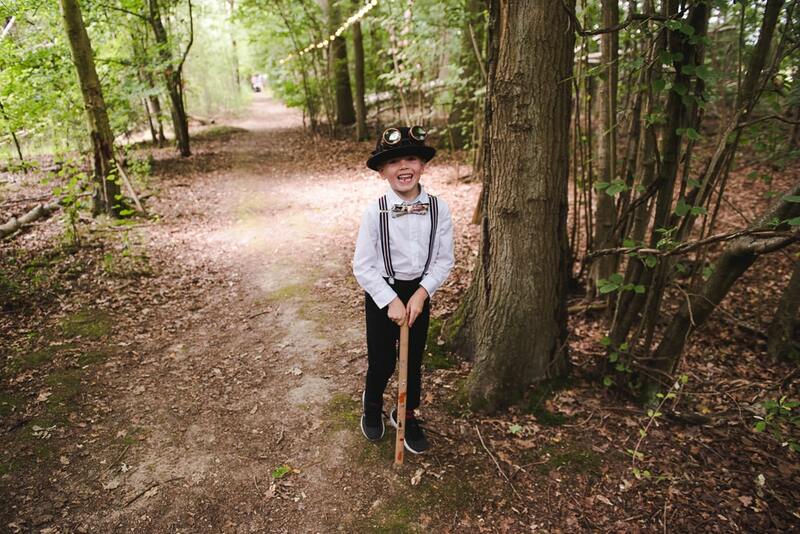 At the end of the day it is your day. 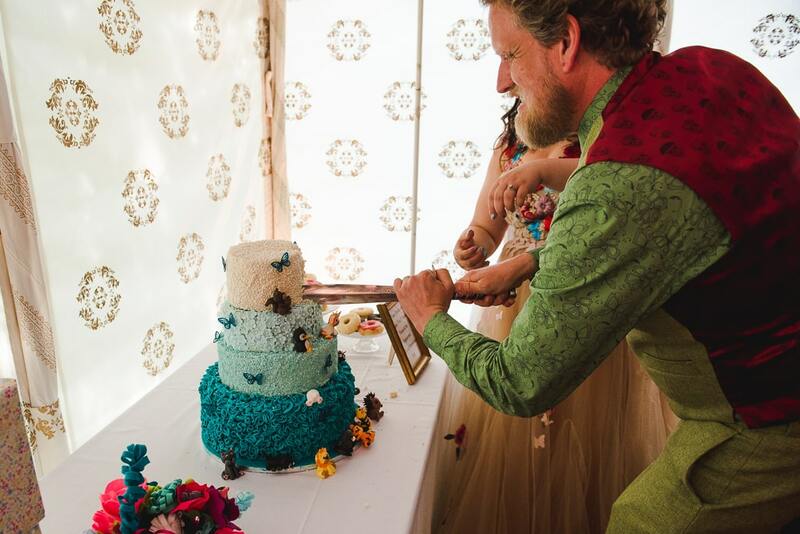 Also don’t get too caught up in too many traditions if you don’t want to. 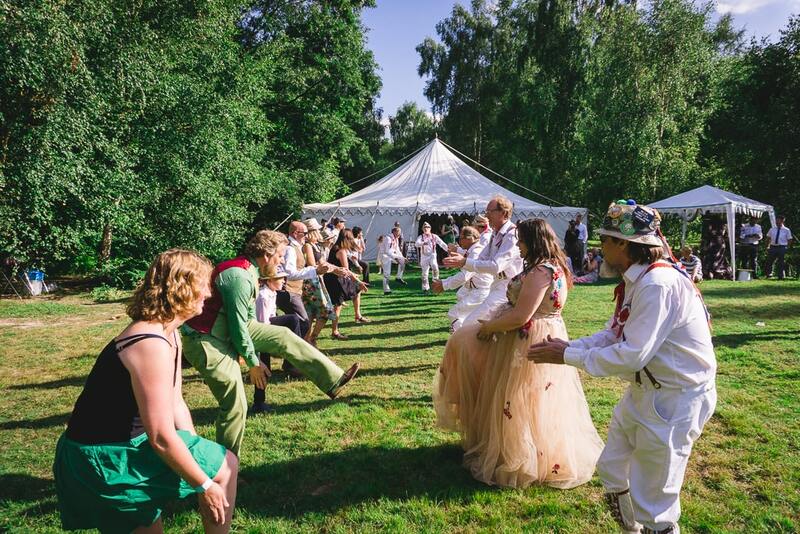 It doesn’t matter if someone wears white to your wedding and it doesn’t matter if someone wears jeans. 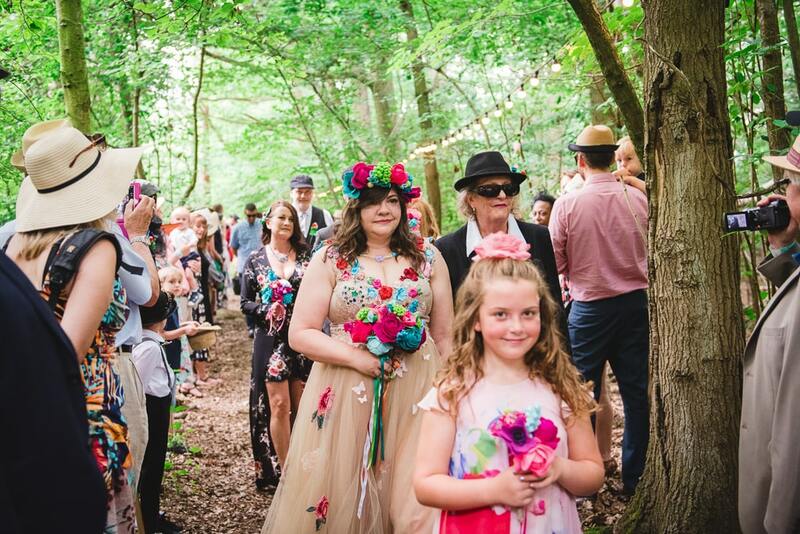 It also doesn’t matter if you want to walk down the aisle on your own, with your mum or with a dog! 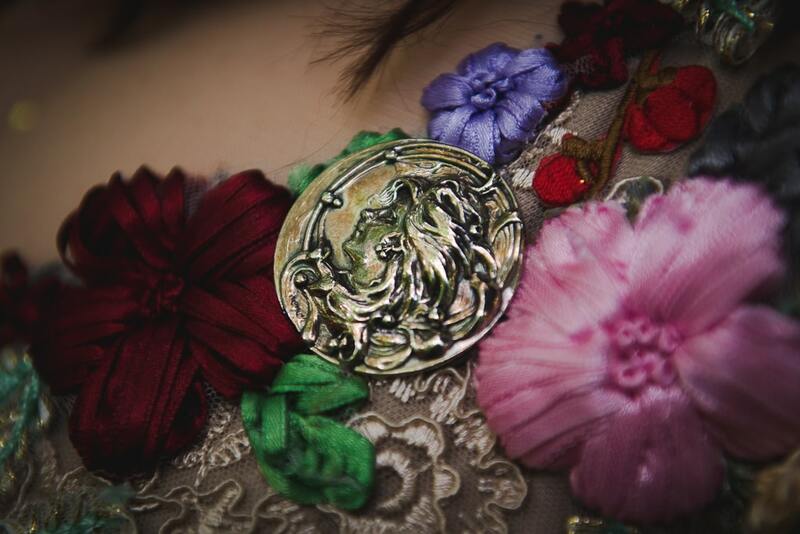 It’s your day. 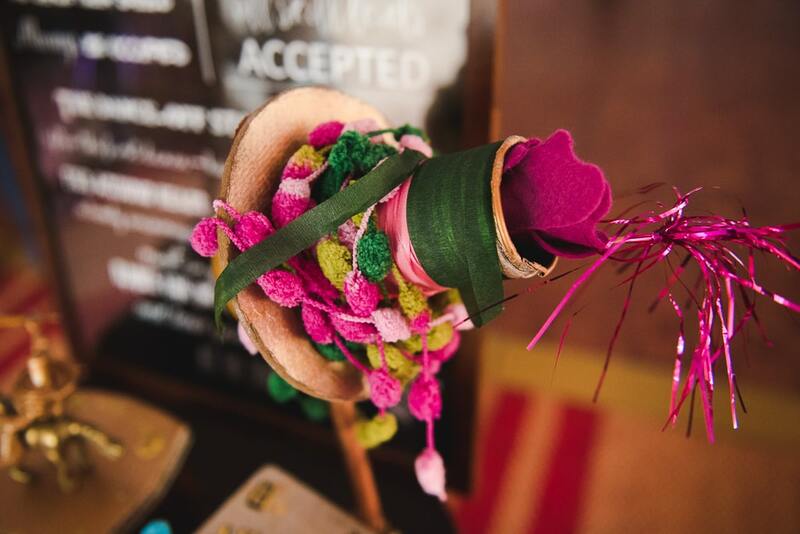 Do it your way. 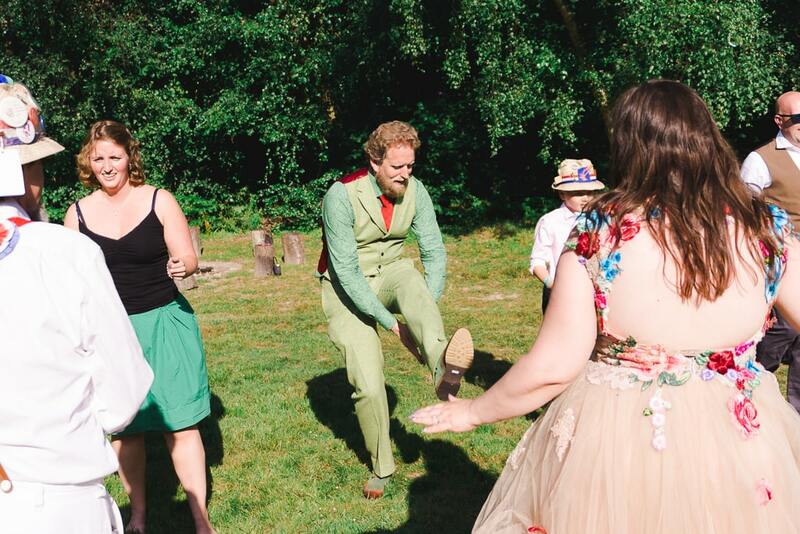 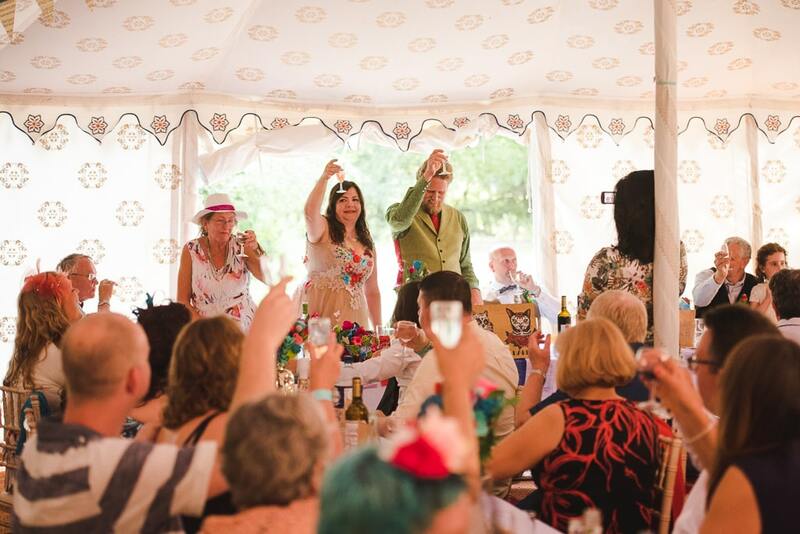 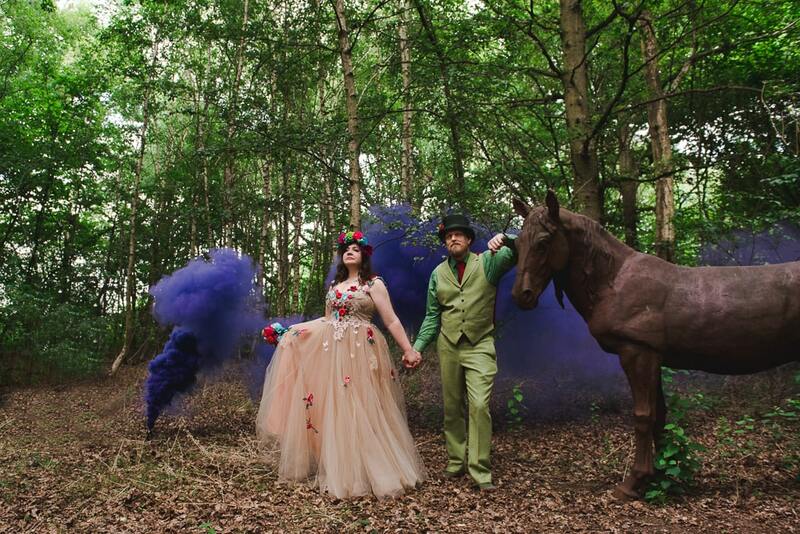 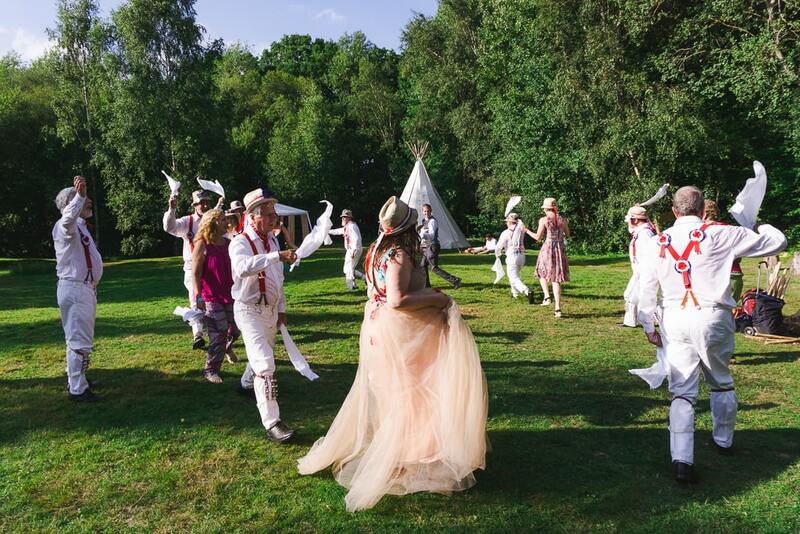 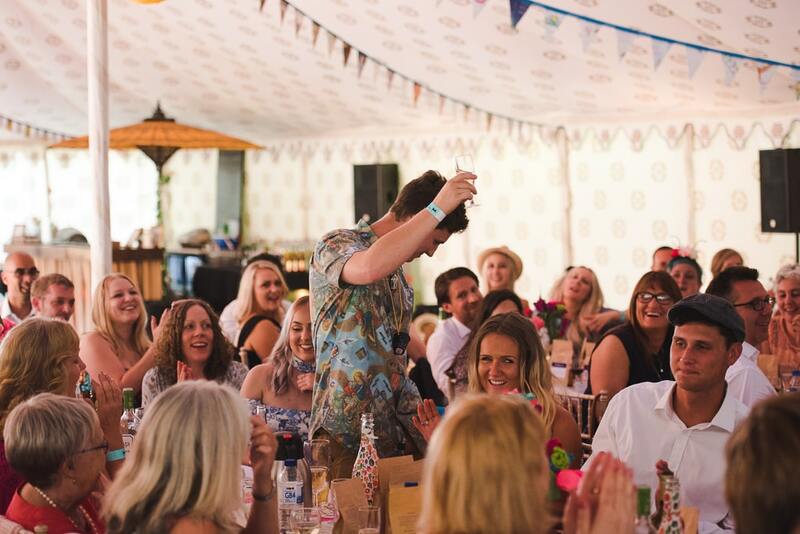 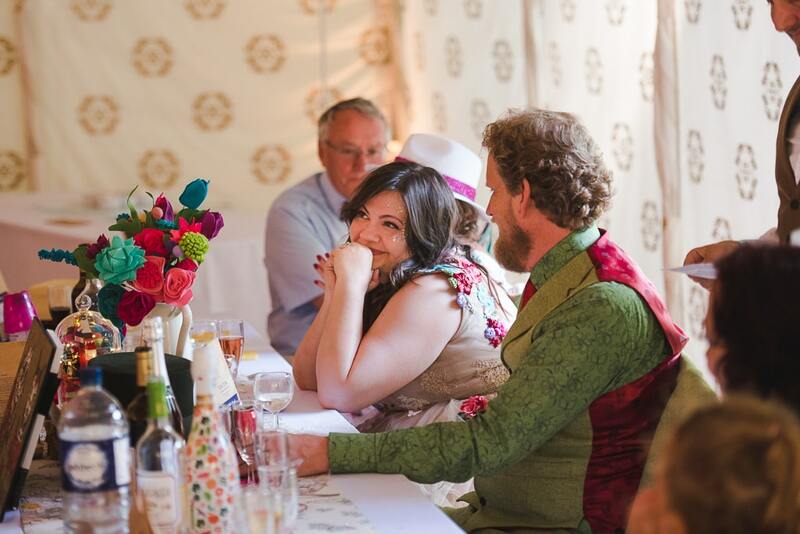 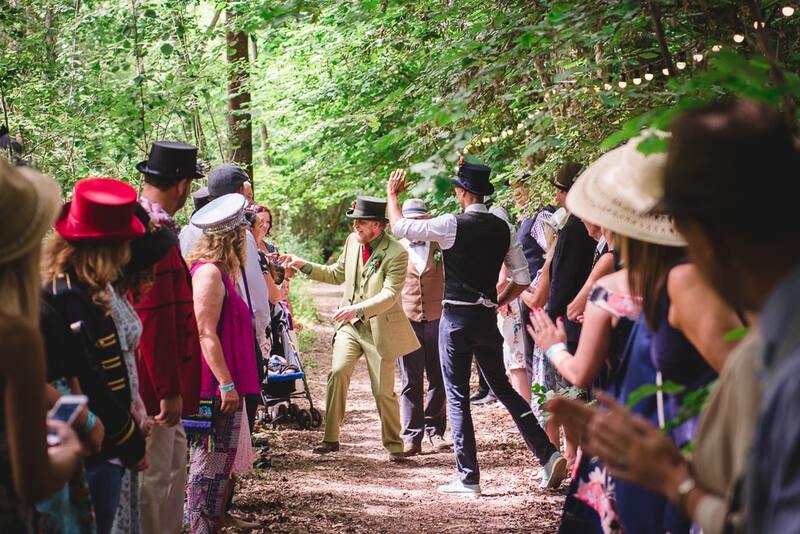 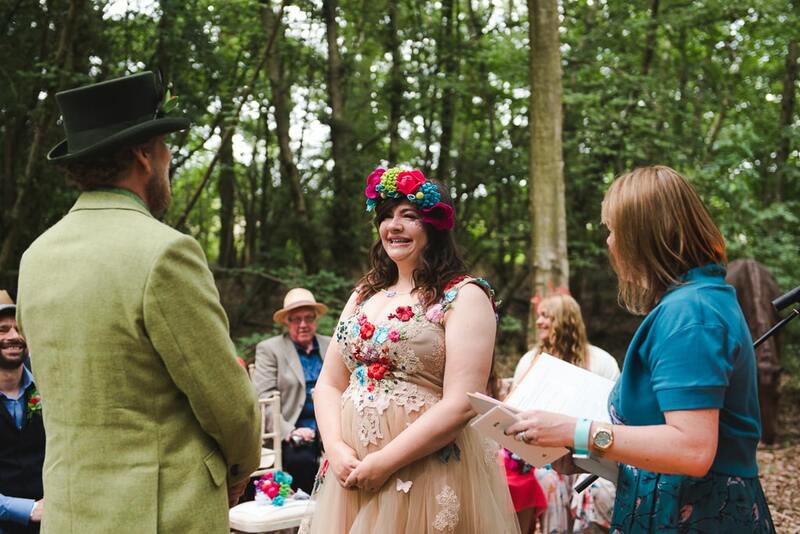 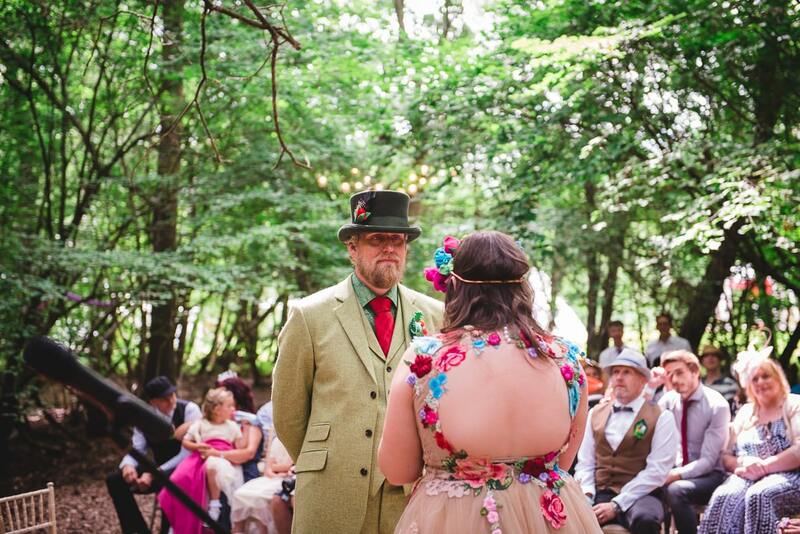 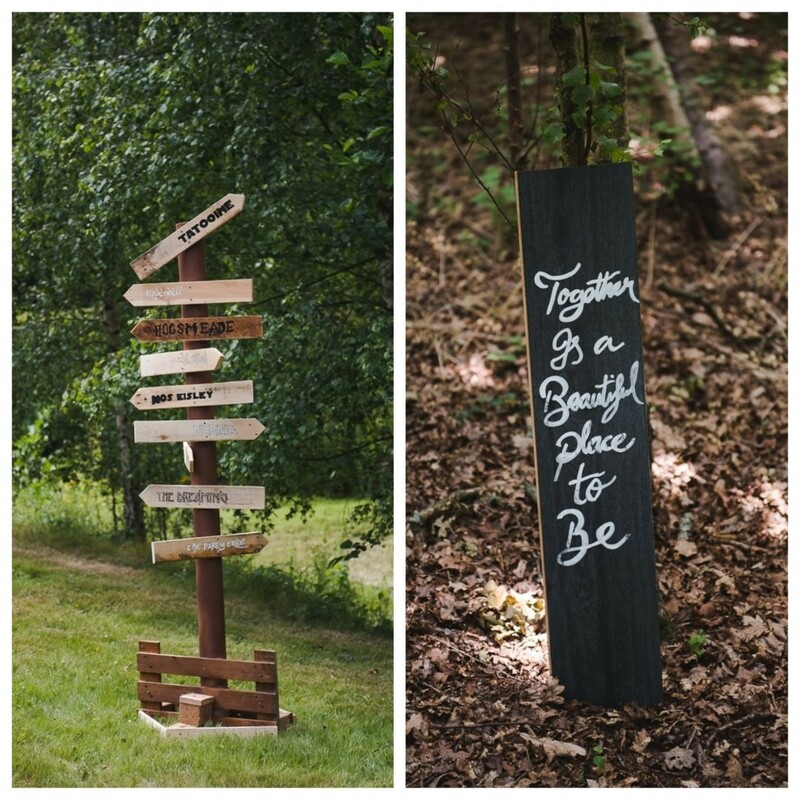 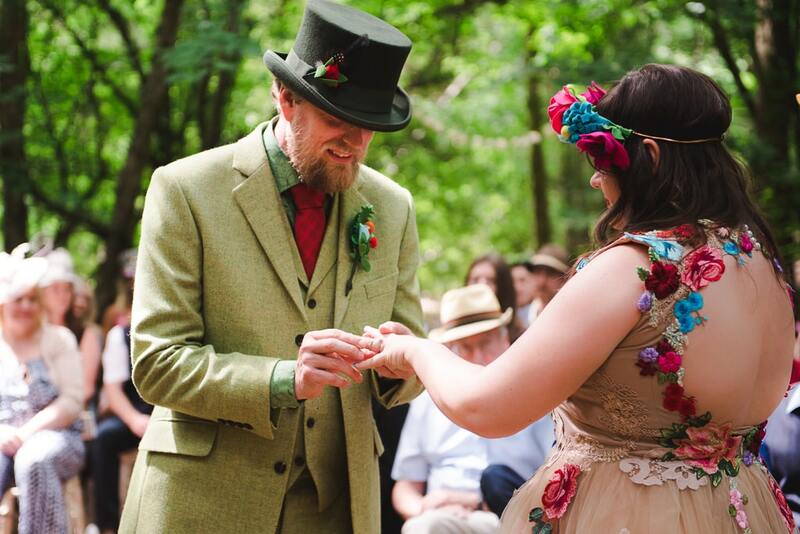 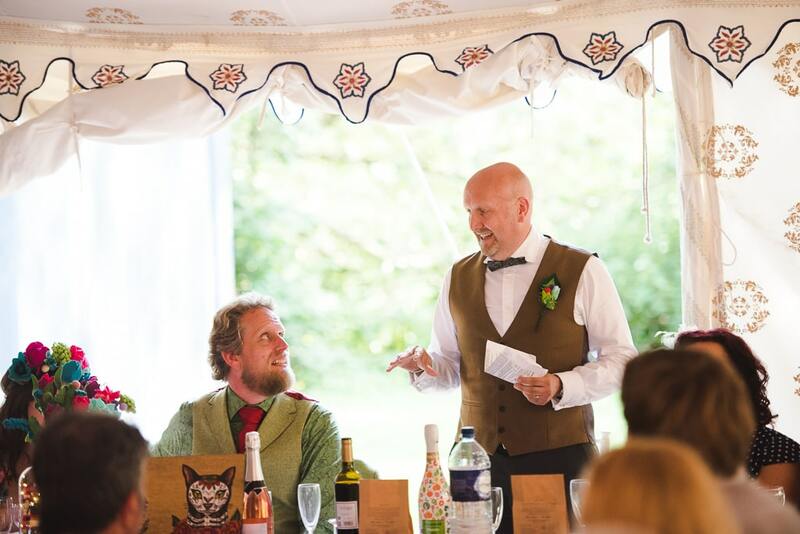 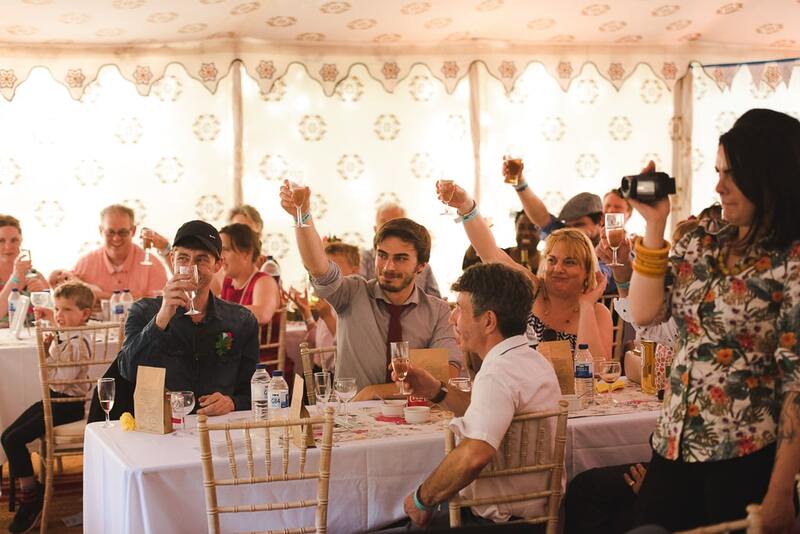 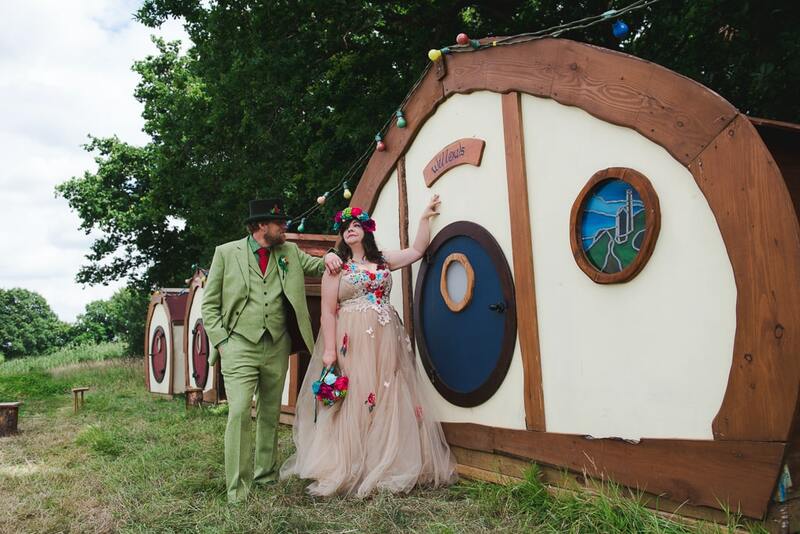 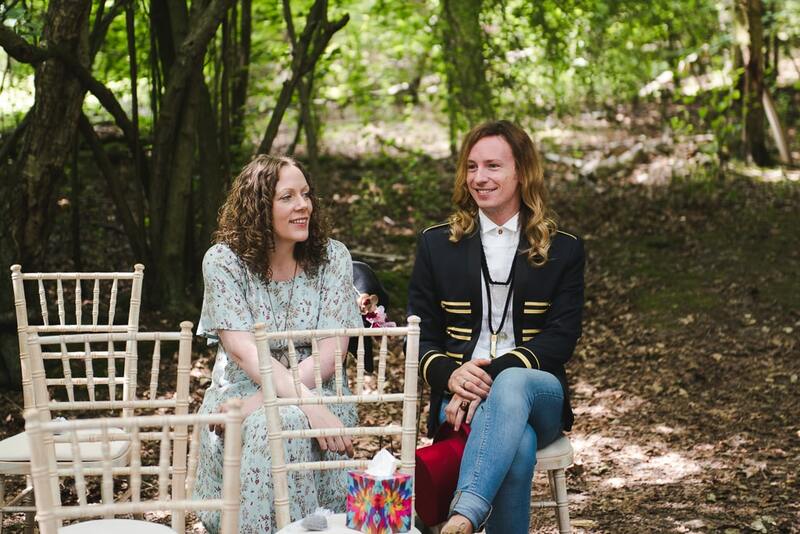 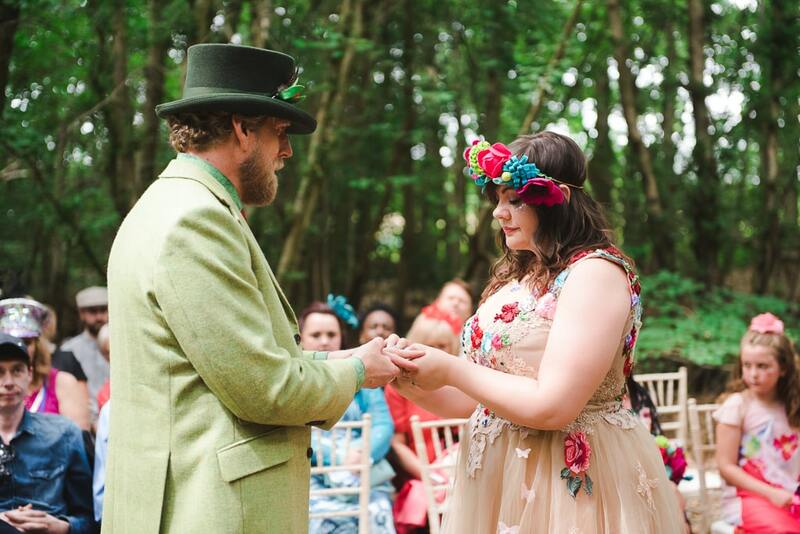 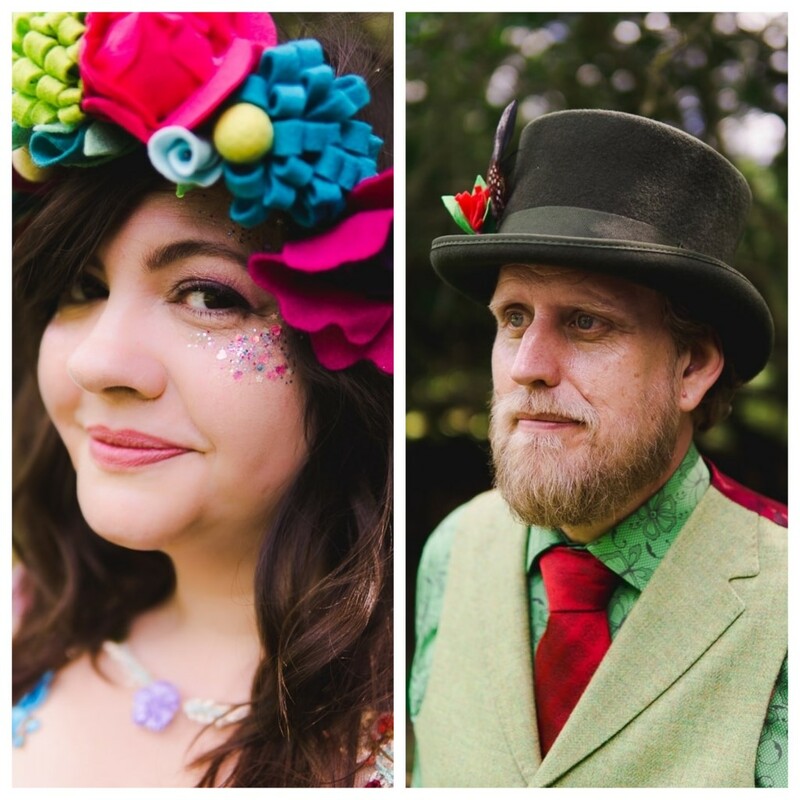 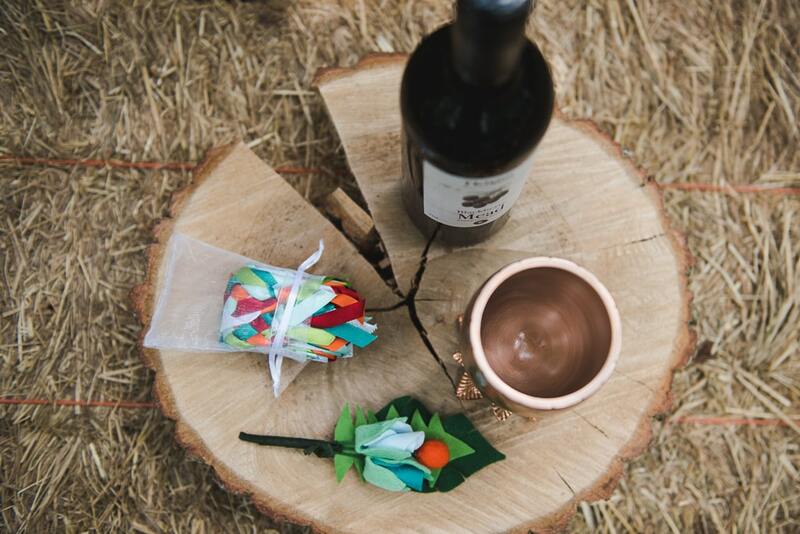 Thank you so much to Amber of Heline for sharing this epic festival inspired wedding. 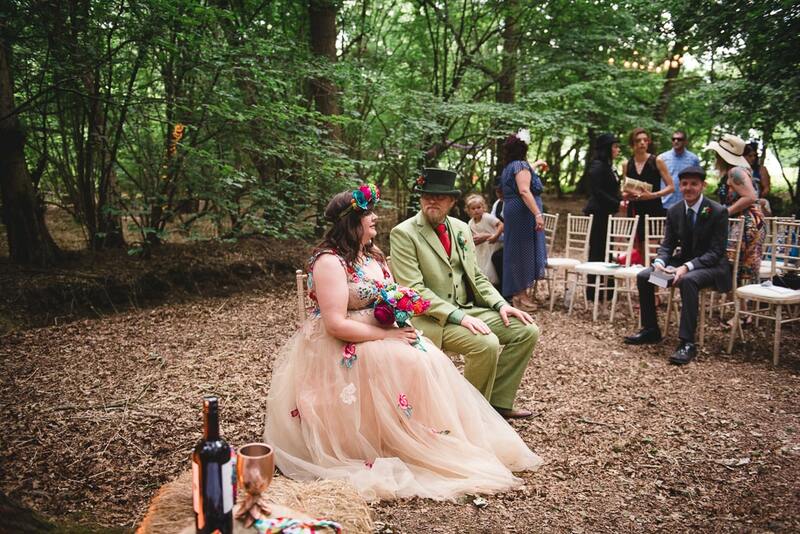 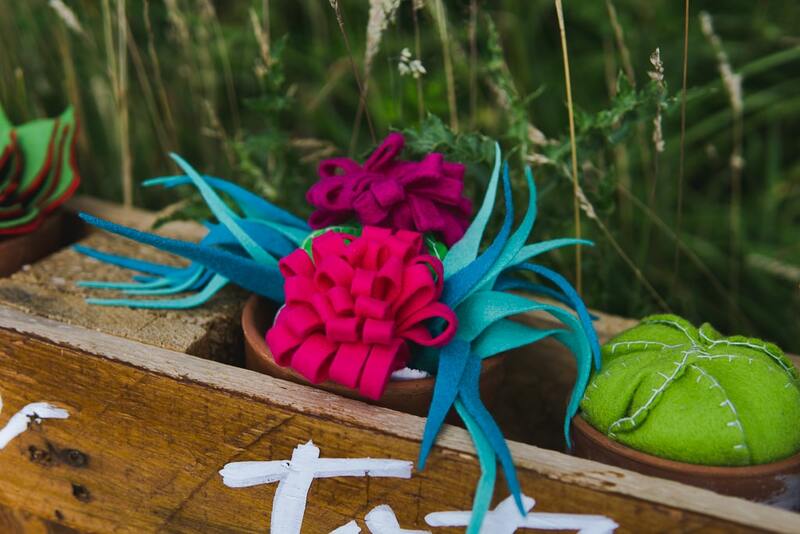 Love the vibrant colours of the styling and the relaxed outdoor ceremony. 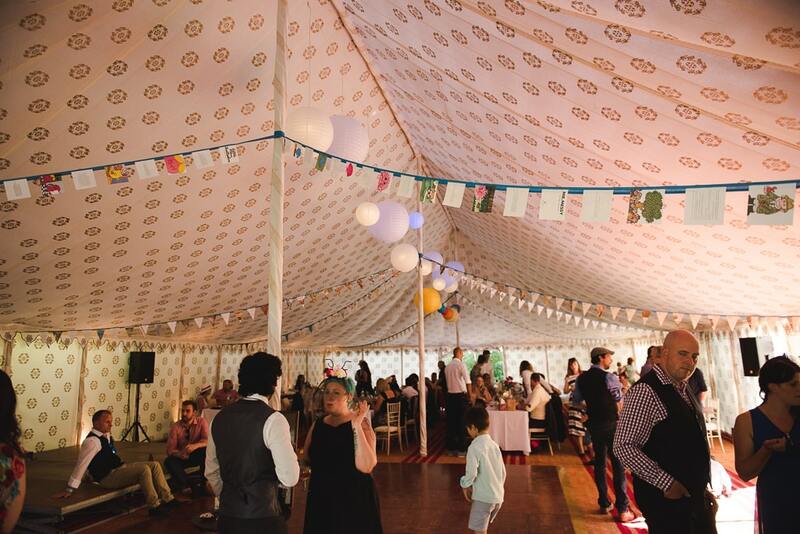 Such a stunning celebration where the focus is firmly on family, friends, fun and incredible personal expression. 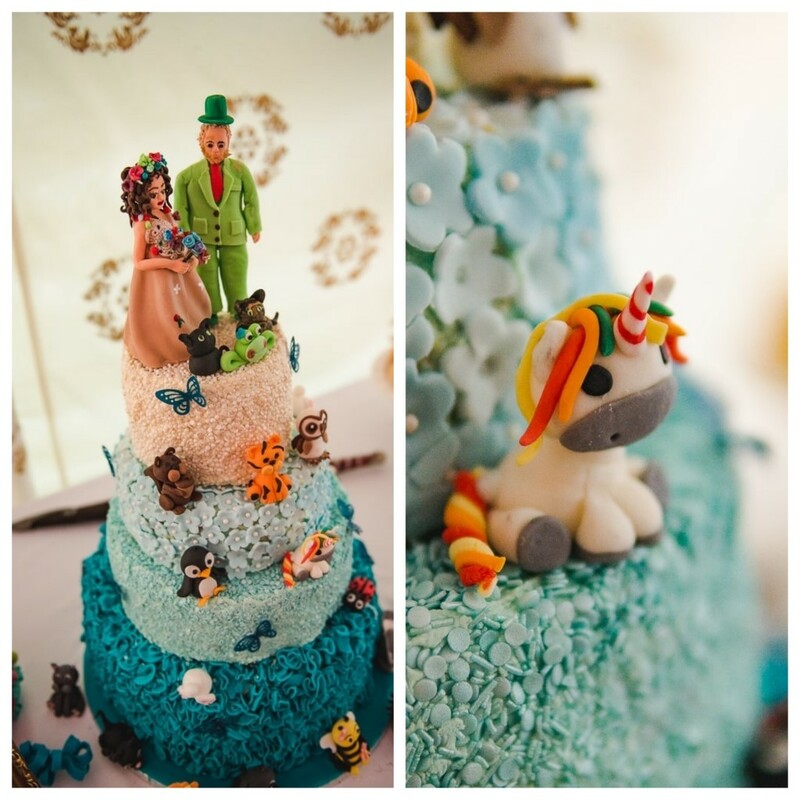 Amazing details and what a fun wedding. 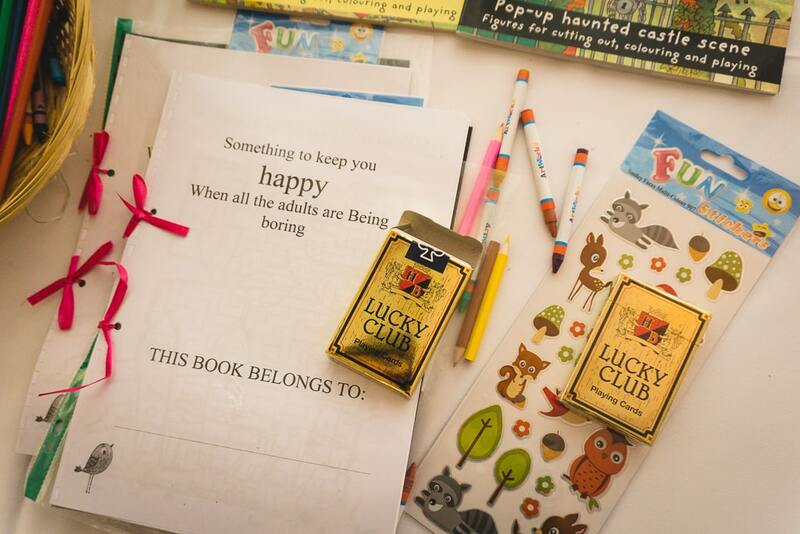 Thx for sharing!